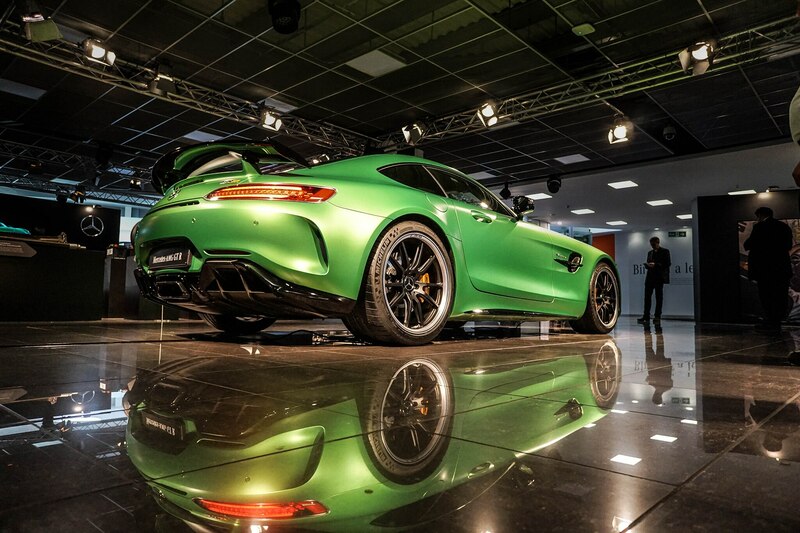 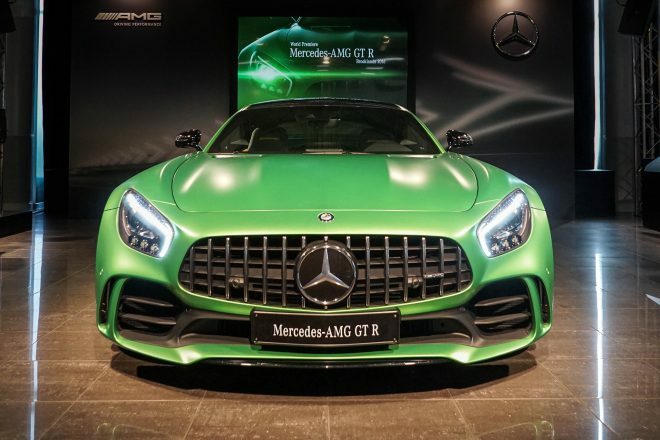 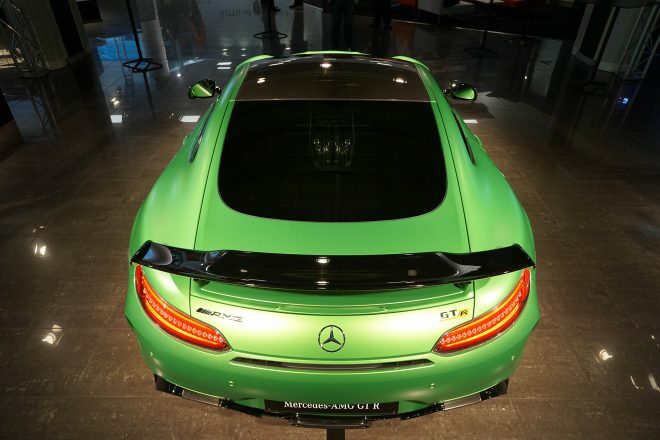 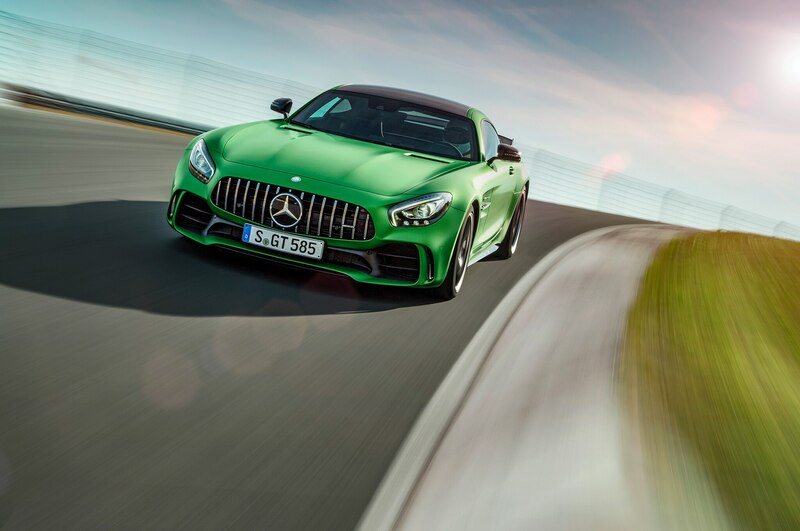 We traveled to England’s Mercedes-Benz World, which sits on the site of historic Brooklands motor circuit, to witness the unveiling of the all-new 2018 Mercedes-AMG GT R on the eve of its appearance at this year’s Goodwood Festival of Speed. 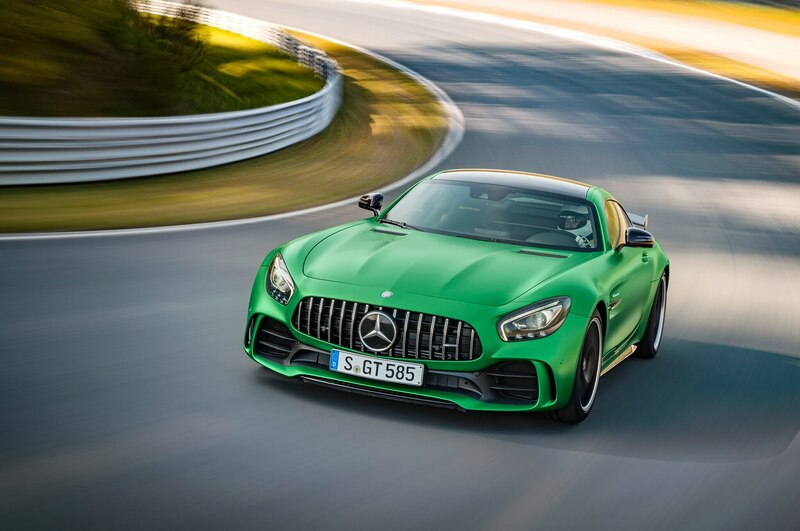 After the crowds cleared from around the GT R, we asked the car’s body, chassis, and aerodynamic engineers a few things you won’t find in the press release. It took two years to finish the GT R’s patented active underbody aero system. 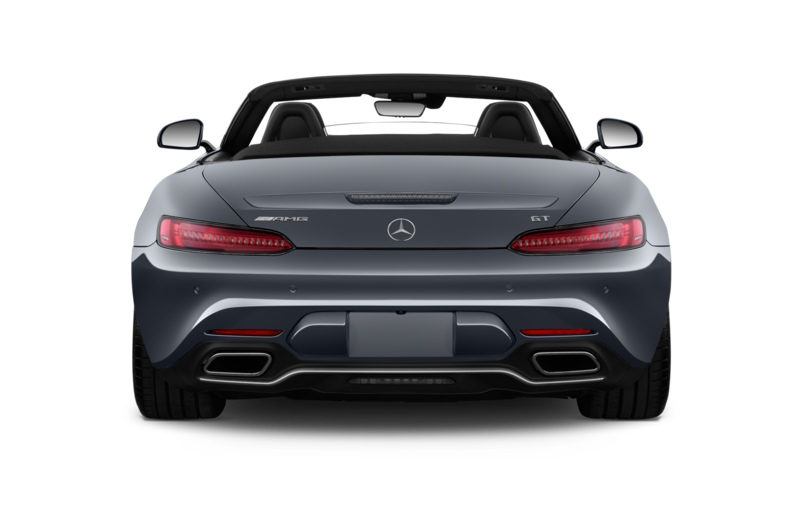 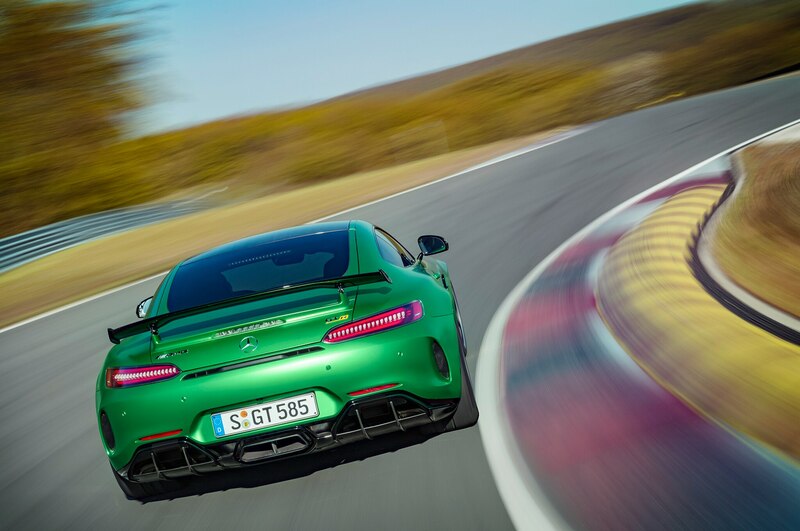 After countless variants, the engineering team came up with a system that reduces front drag and lift, increases air speed under the car, decreases pressure, and does that all without affecting the rear end’s aerodynamics. “It’s the masterpiece of the car,” says head of aerodynamic development for AMG, Gustavo Estrada. 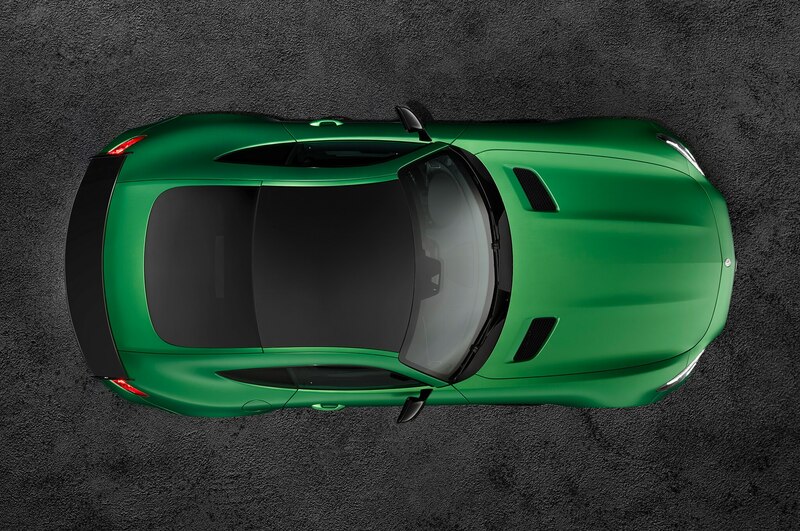 If the GT R didn’t have its active underbody aero system, it would need a 4-inch front splitter. 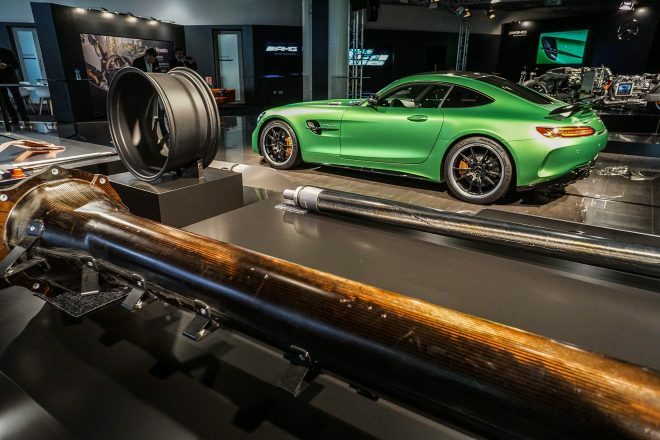 At least it would if it wanted to have anywhere near the same performance. 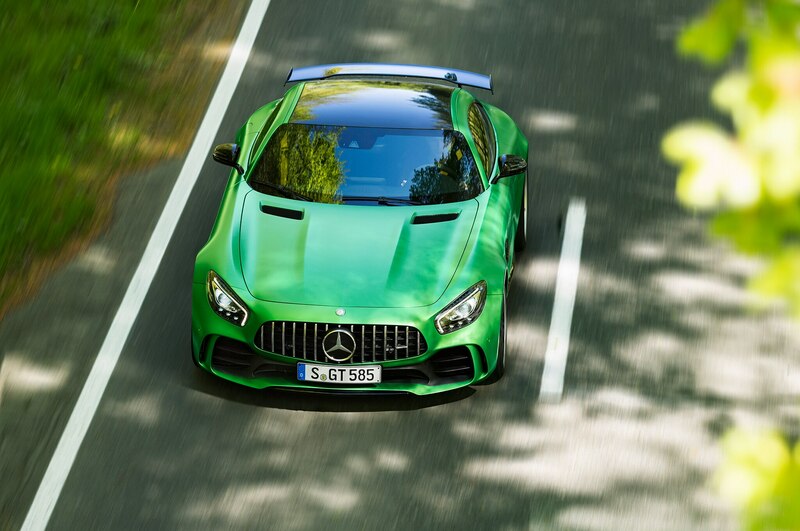 Early spy shots of the GT R lapping the Nordschleife show a similar setup. 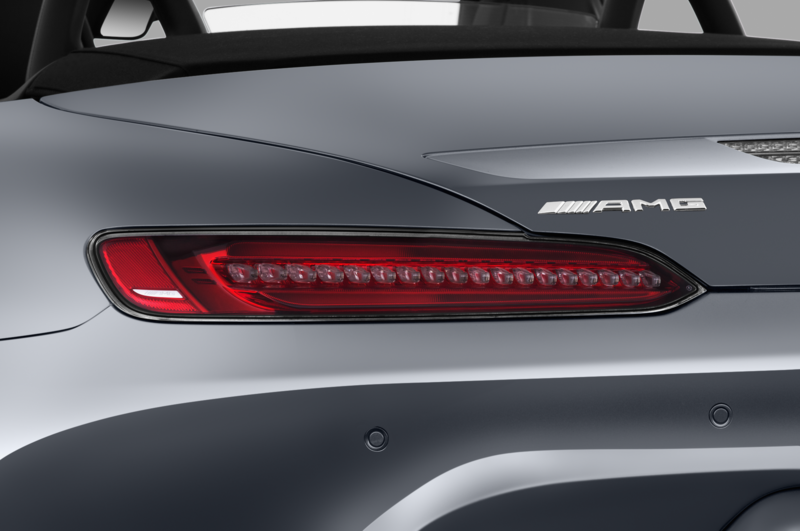 The rear wing is manually adjustable because it can be. 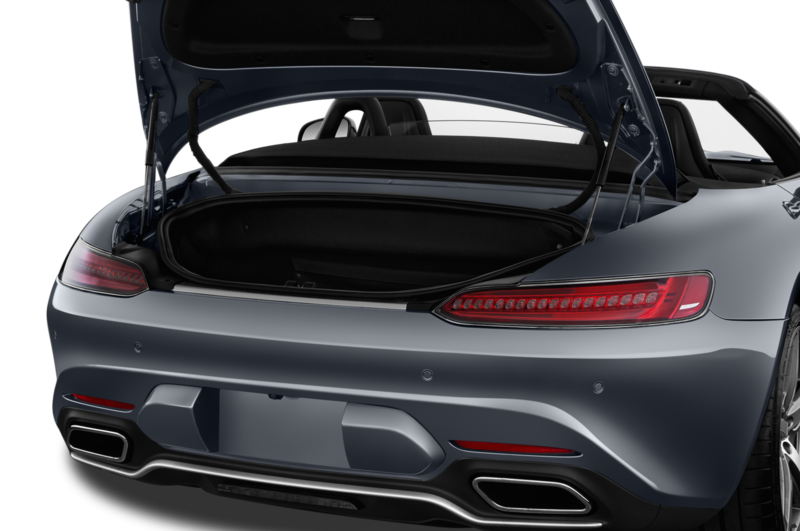 If the active underbody aero system had any effect on the rear end’s dynamics, an electronically controlled wing would’ve been needed. 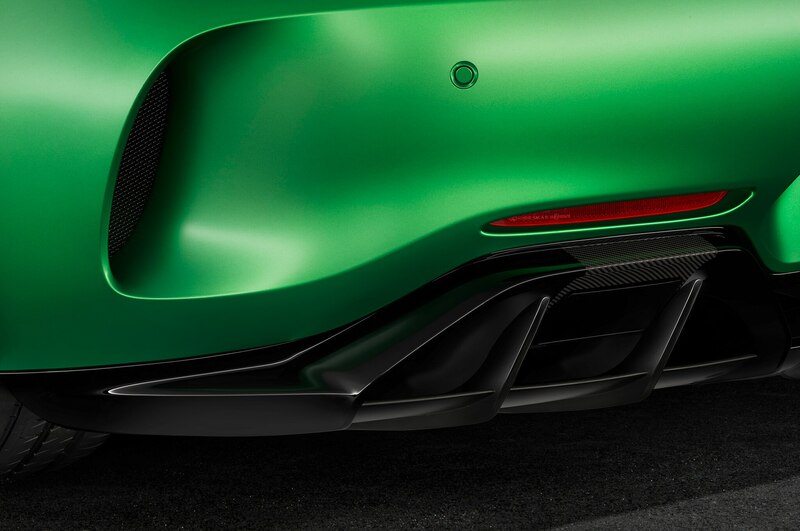 But since the active system benefits the GT R’s front end without affecting the rear of the car, drivers can and should feel free to adjust the rear wing to their liking. 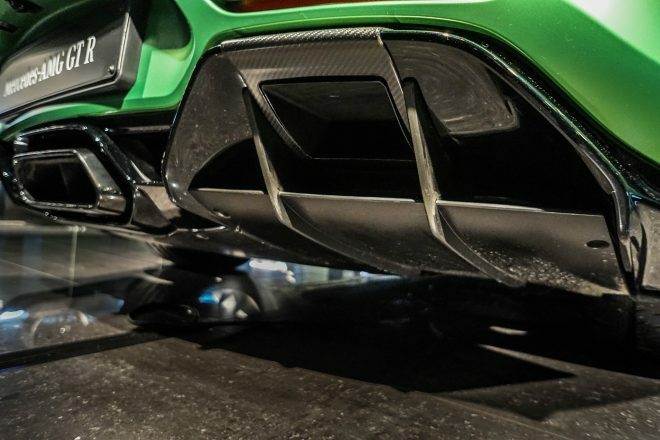 It’s amazing how hot air comes out of the back of the GT R. Gustavo’s team found a fascinating way to use air pressure to channel the 500-degree air that surrounds the center-exit exhaust’s titanium muffler through the double-deck rear diffusers. 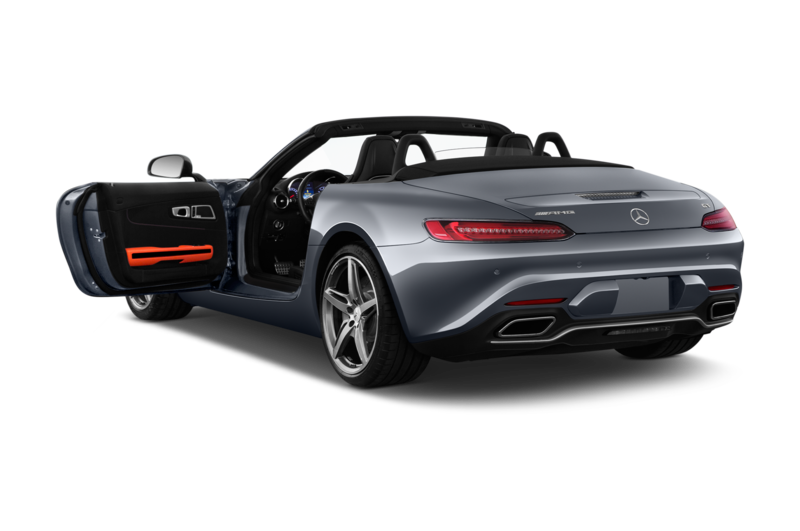 No physical conduits were needed. 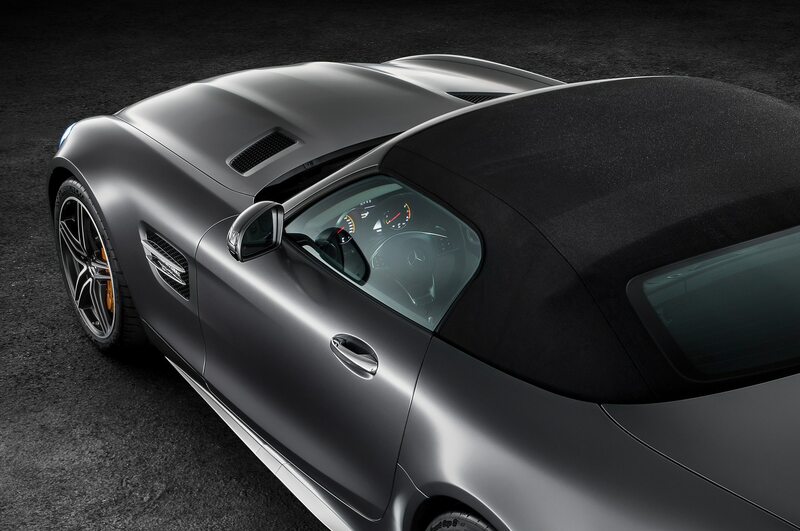 Getting the GT R’s aluminum and carbon-fiber pieces to play nice took some time. 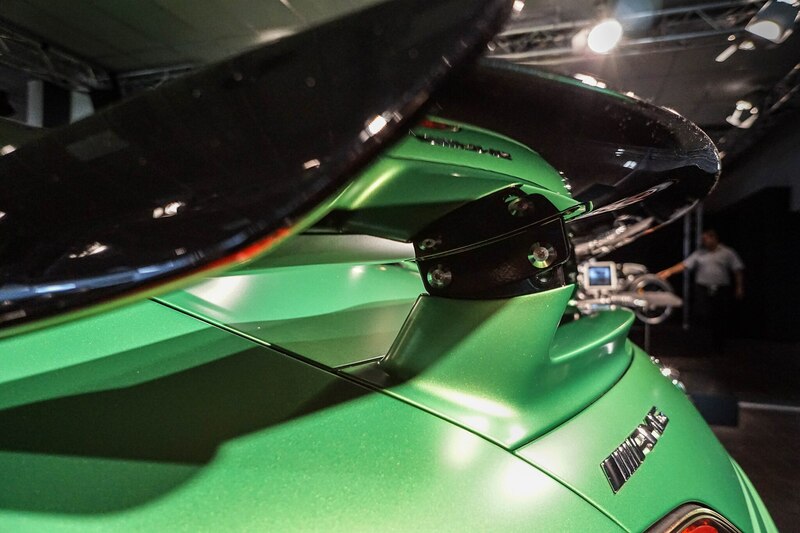 Because the carbon-fiber front fenders and aluminum body are sent down the same paint line, they needed to be prepped with similar processes and endure the same stresses, which isn’t easy when you consider that aluminum and carbon fiber expand at very different temperatures. 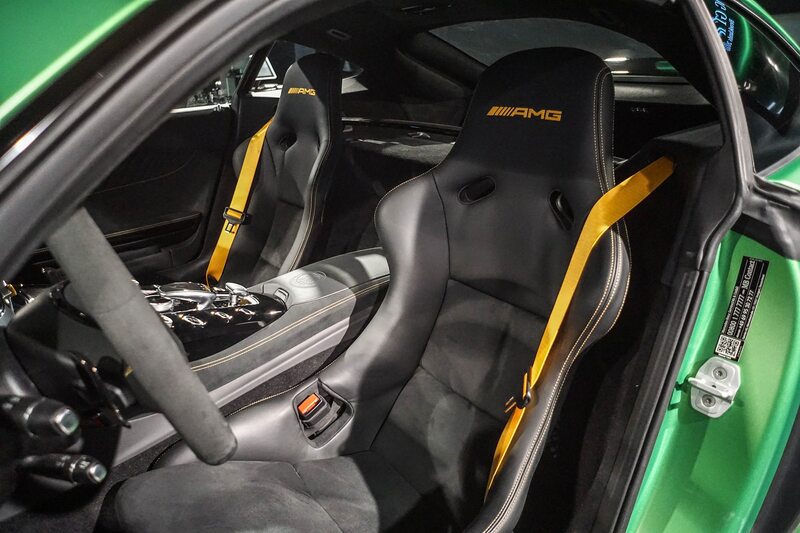 The GT R uses fiberglass, and it’s better than Kevlar or carbon fiber. 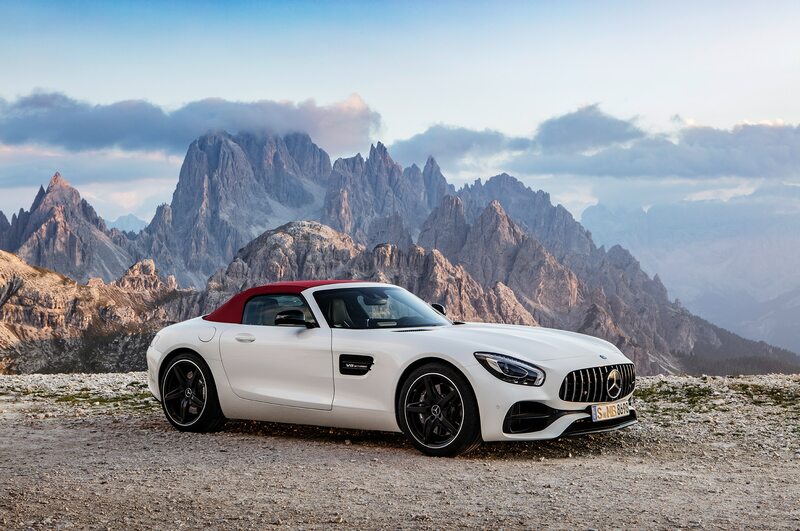 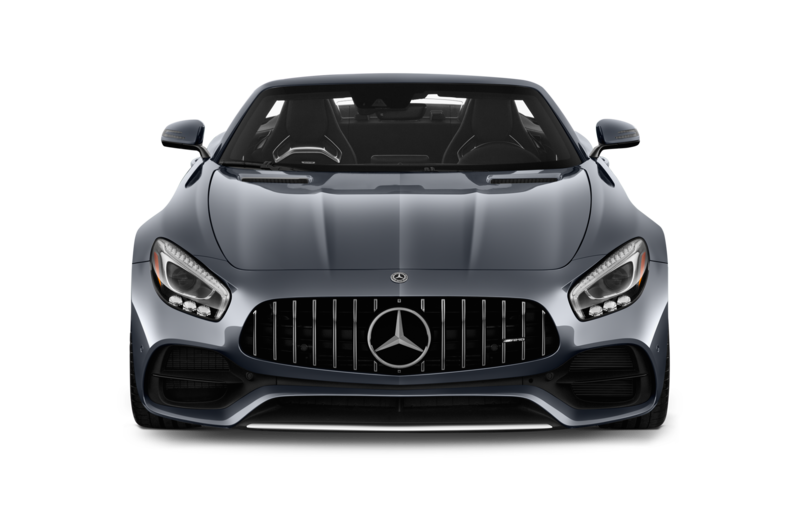 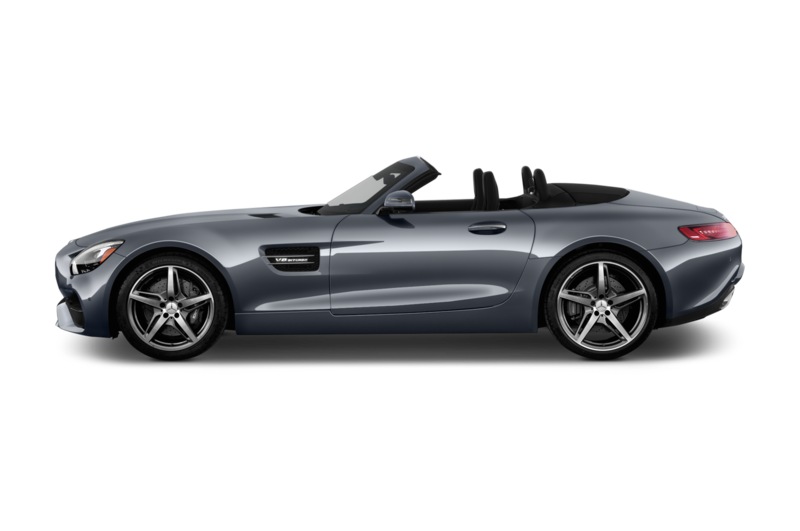 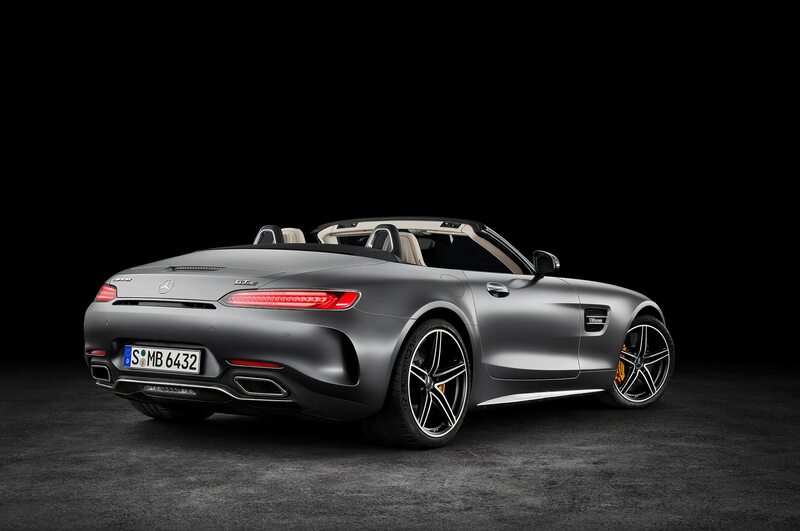 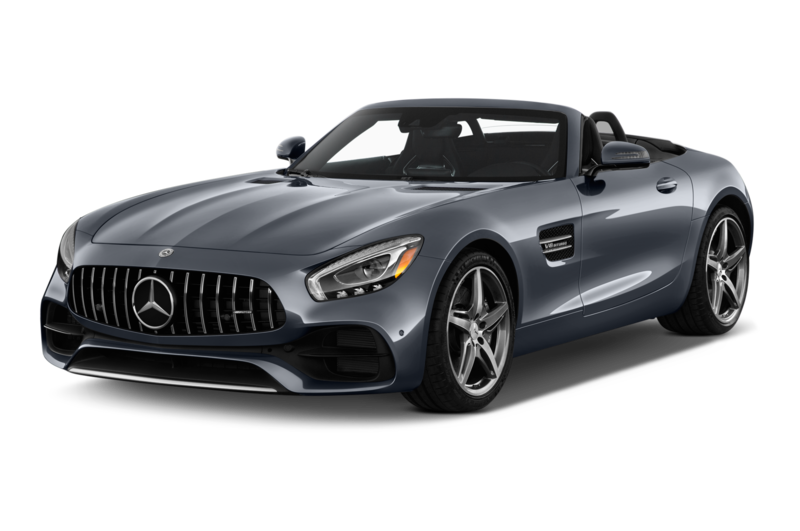 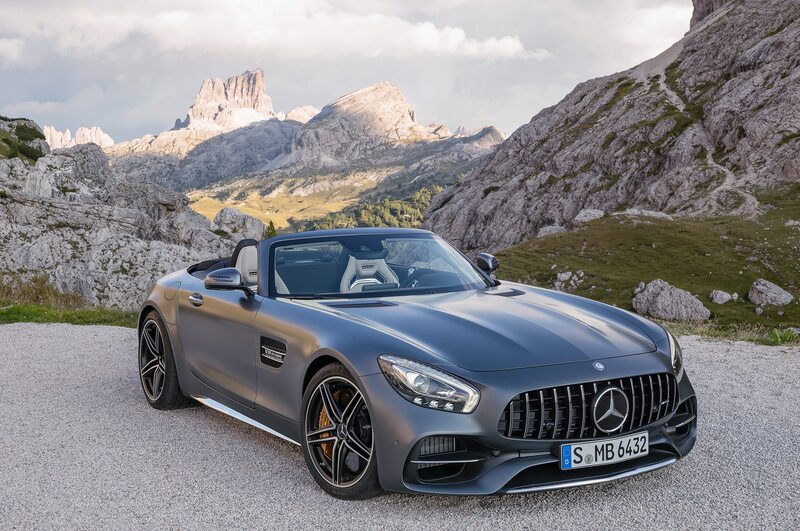 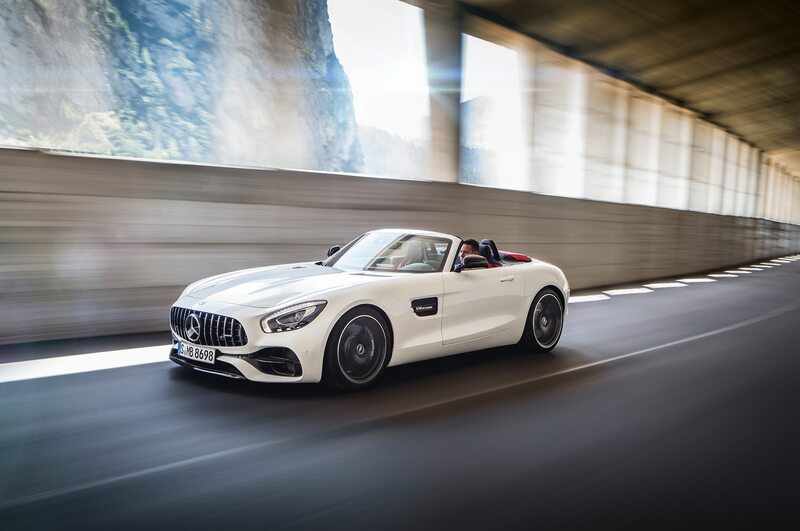 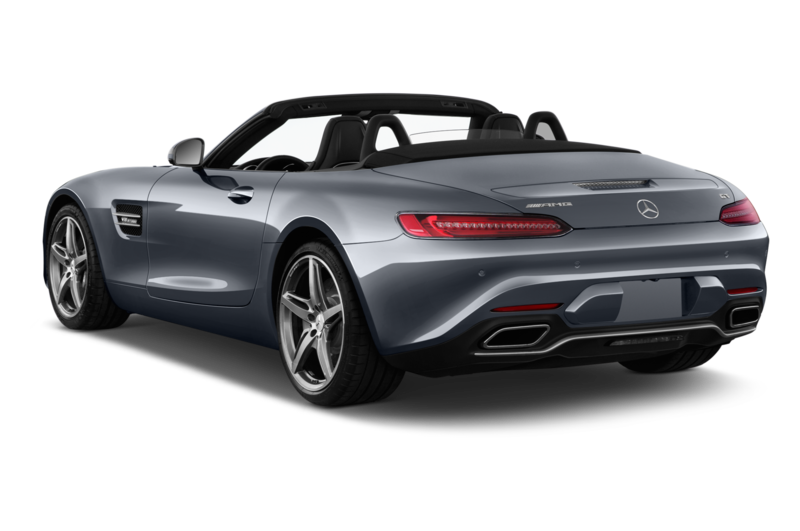 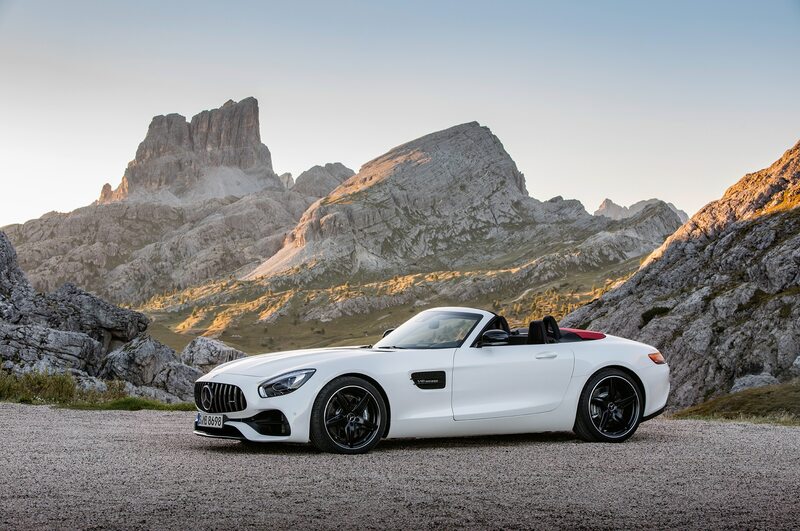 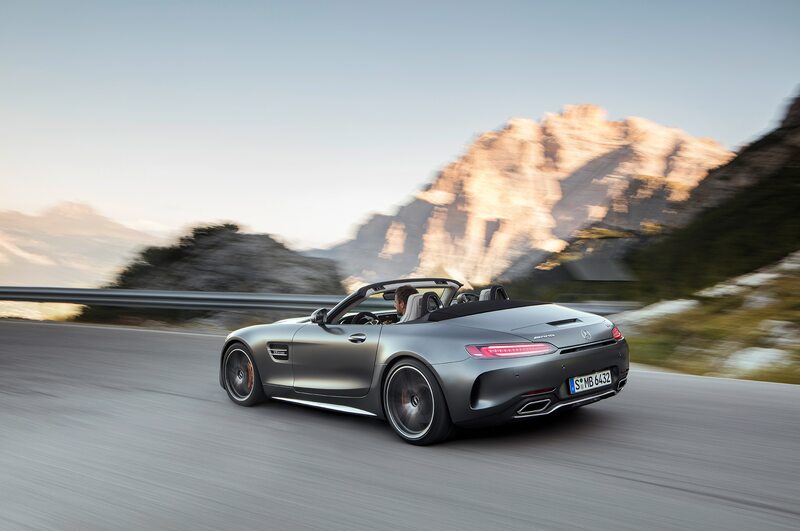 General manager for body development at AMG, Jörg Miska, says “old-school fiberglass” beat out more expensive materials when it came time to redesign the wheel catches in the front wheelwells. 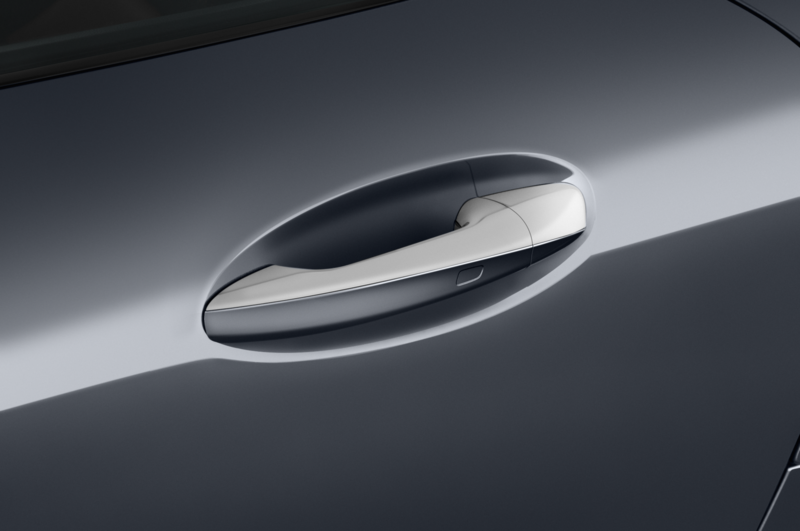 A thin sheet of fiberglass with a bit of cork in the middle has a good deflection rate that will catch any wayward wheels in the case of a front-end collision. 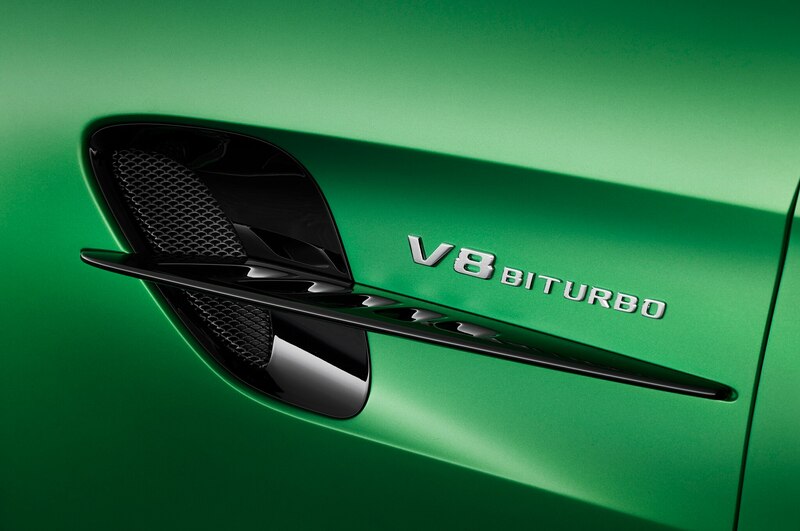 The rear-wheel steering system required an all-new body casting and called for spherical uniball bushings. 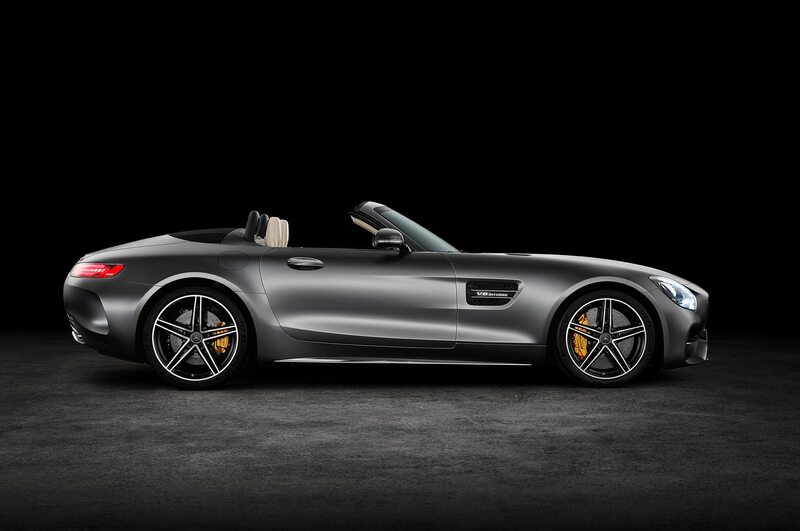 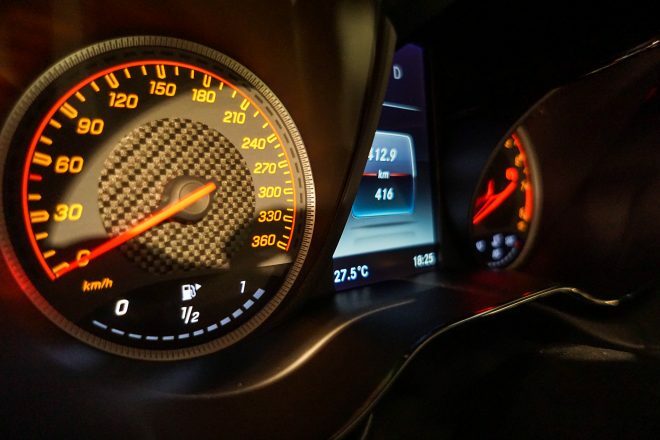 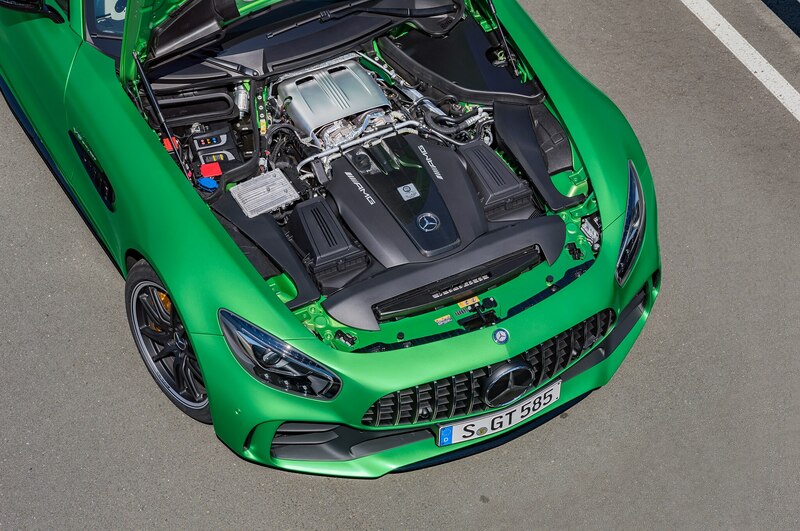 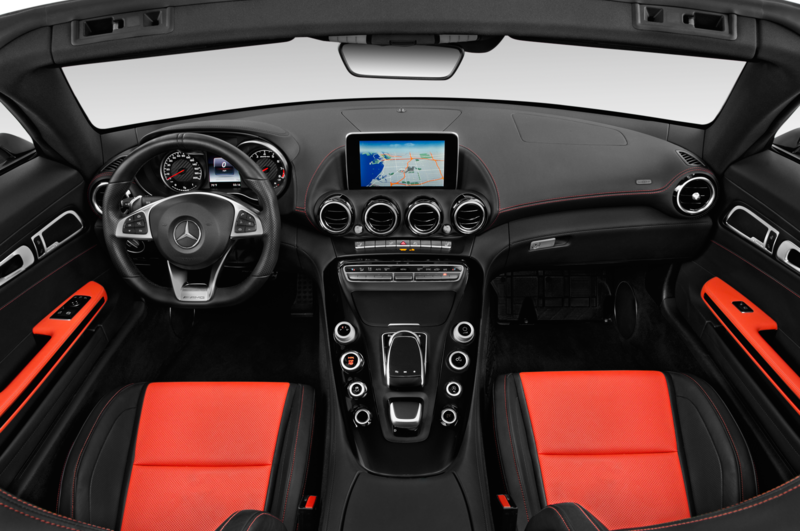 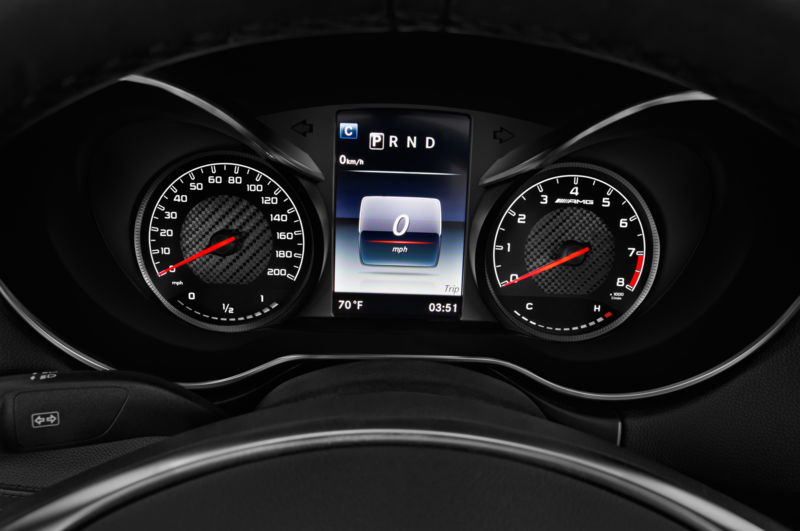 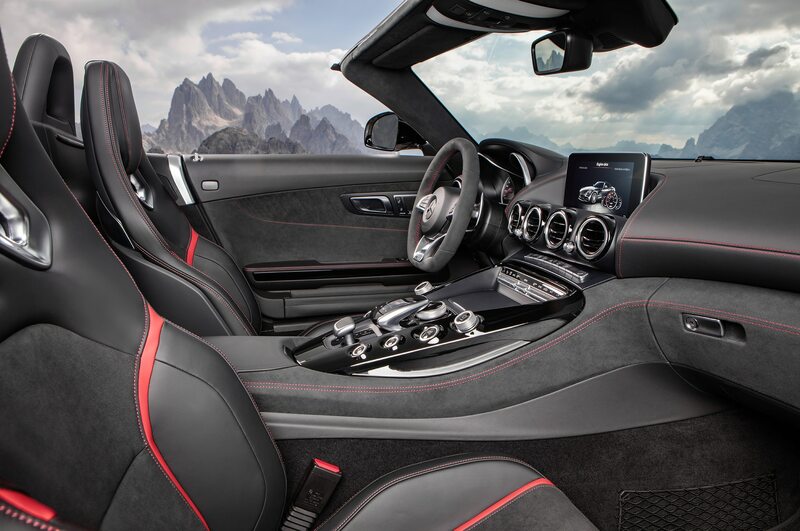 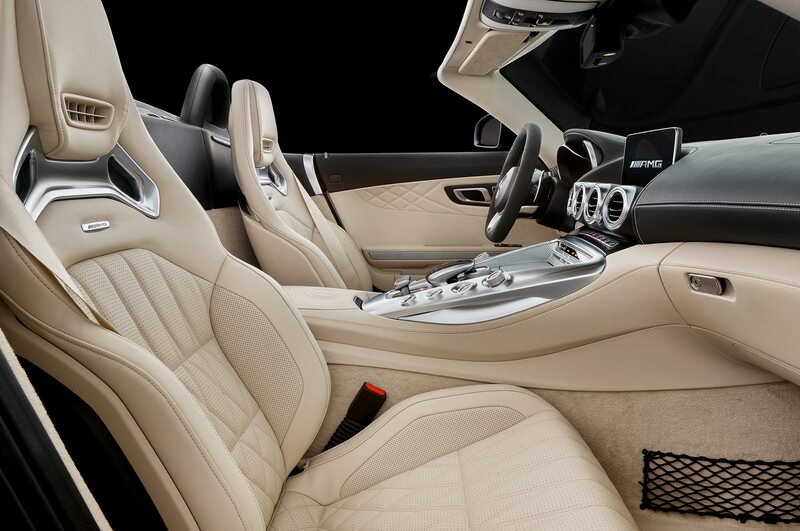 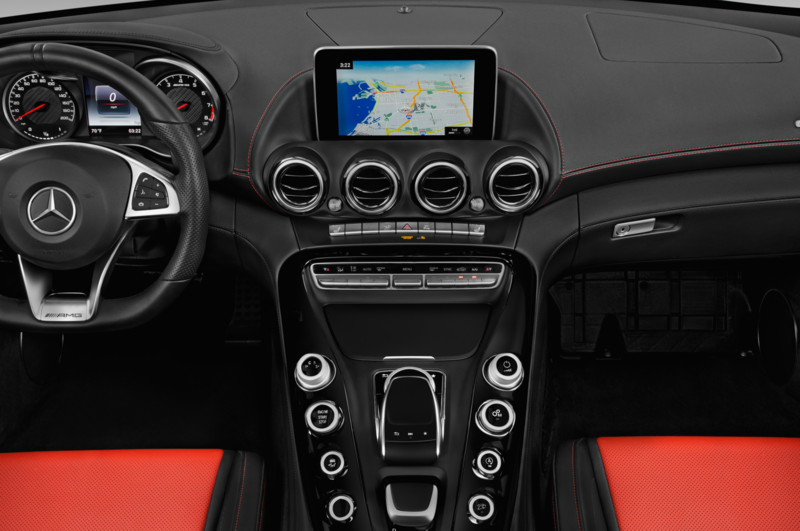 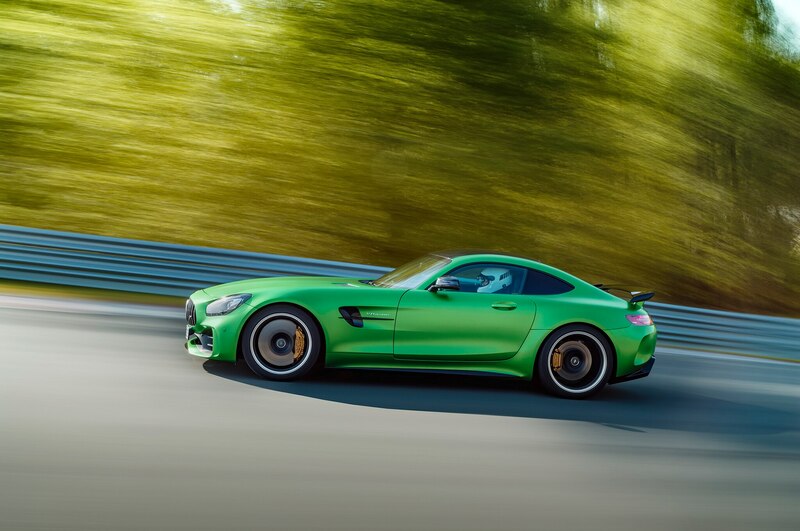 More than 10,000 hours were spent tuning the GT R’s rear-wheel steering system, a first for AMG. 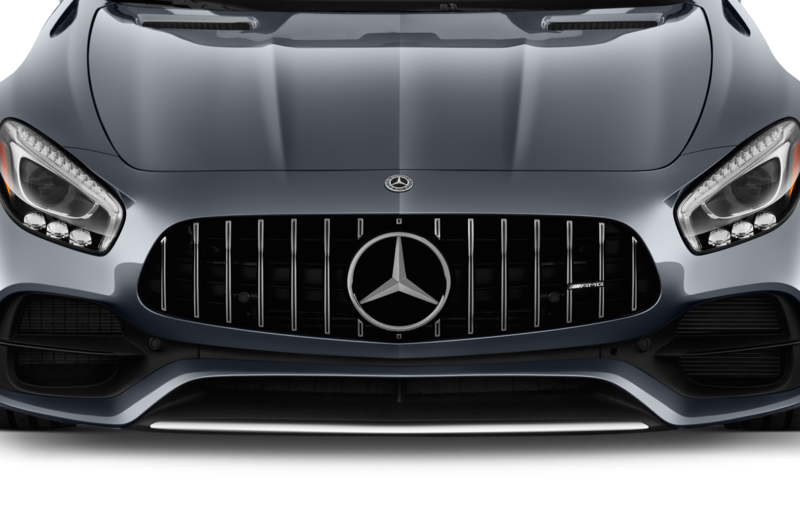 The integration of the system required a very expensive retooling in order to make everything mesh with the aluminum spaceframe. 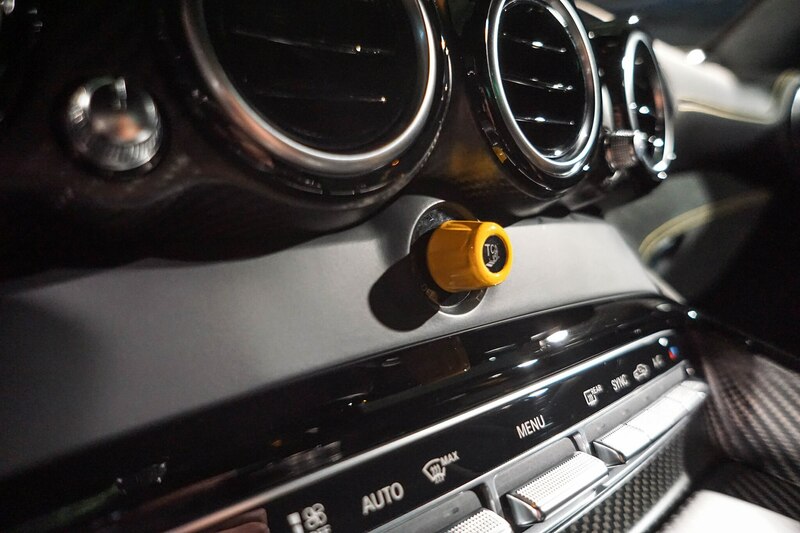 Spherical uniball bushings were used to improve rear-wheel response time. 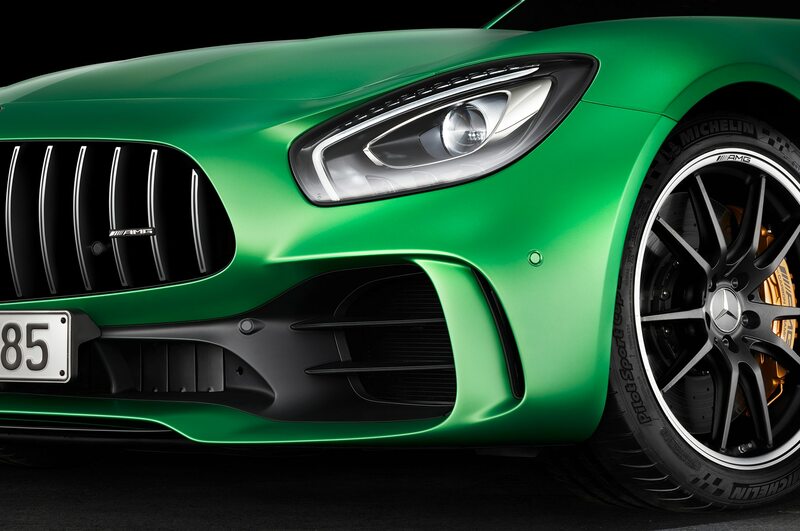 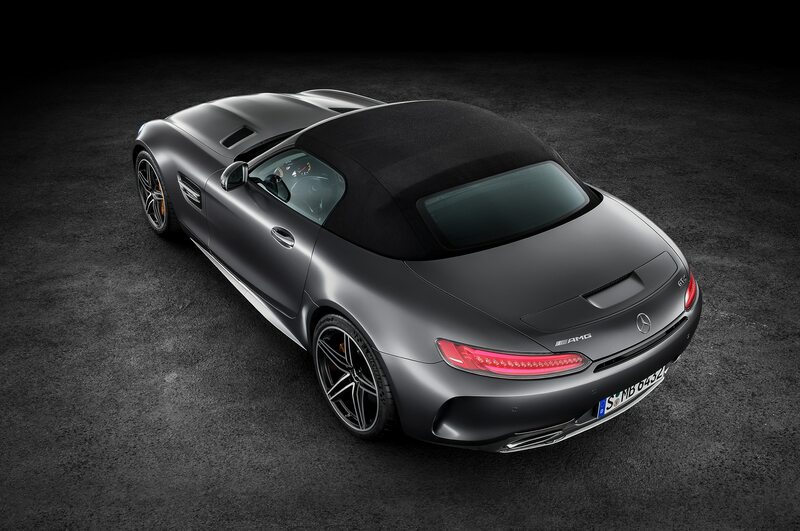 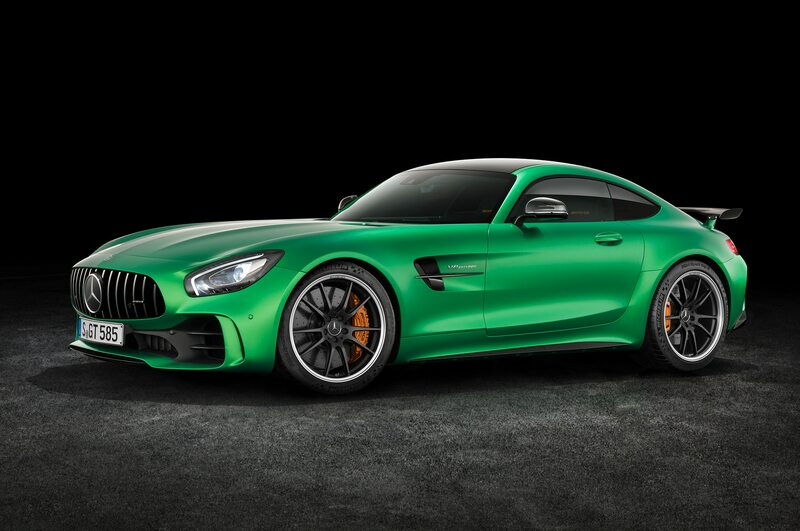 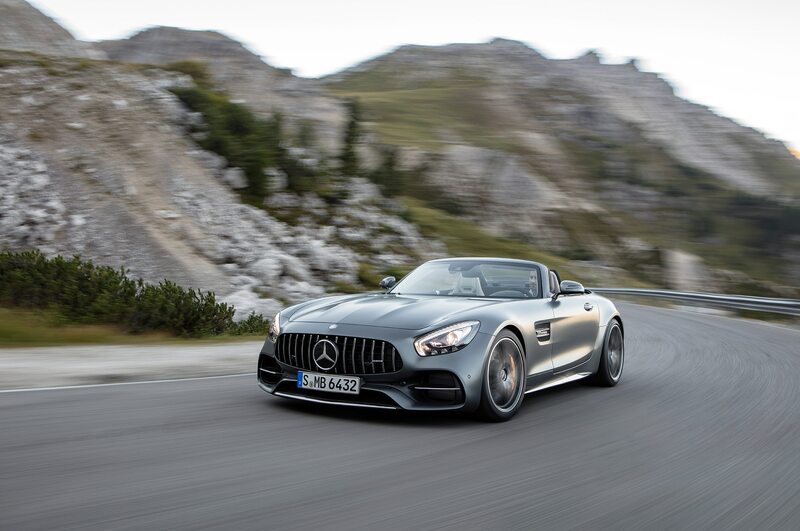 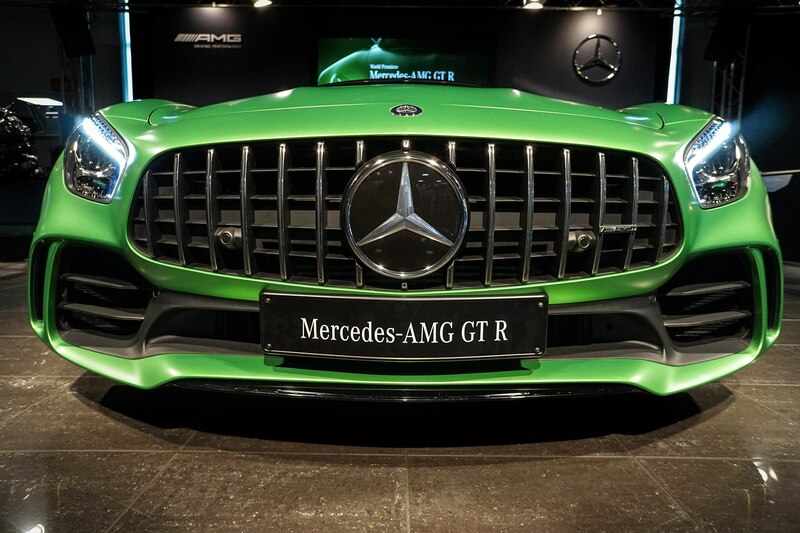 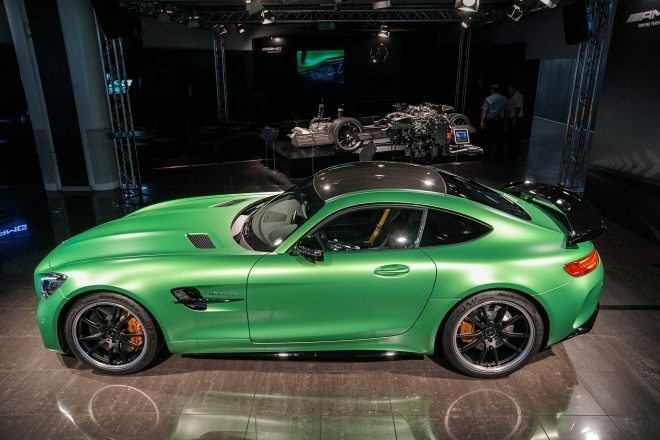 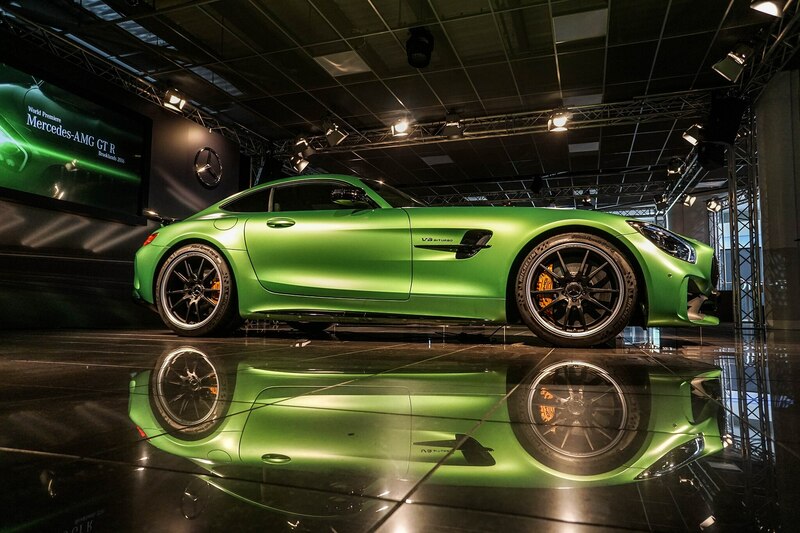 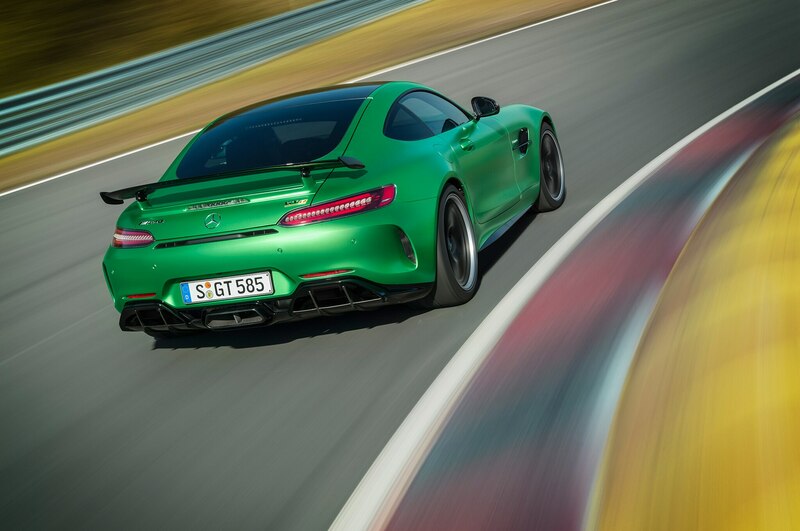 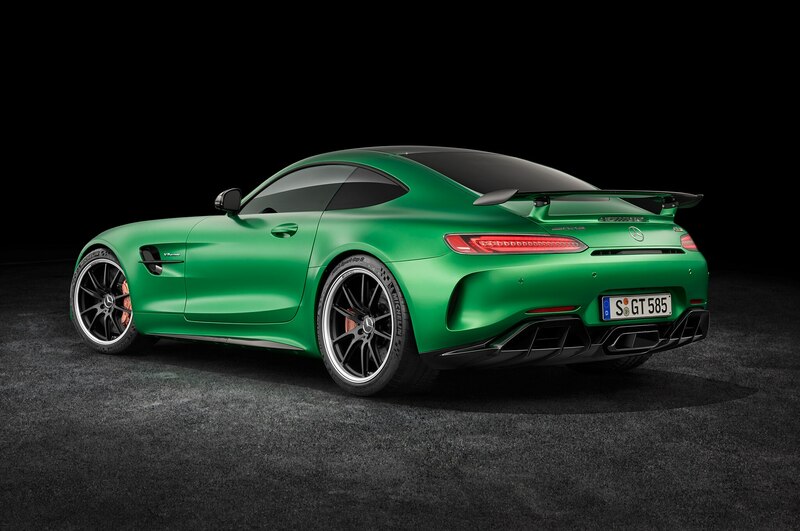 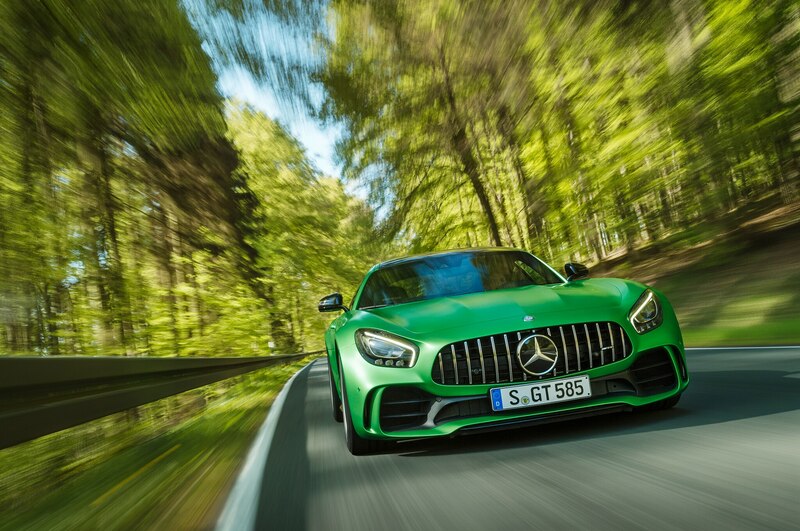 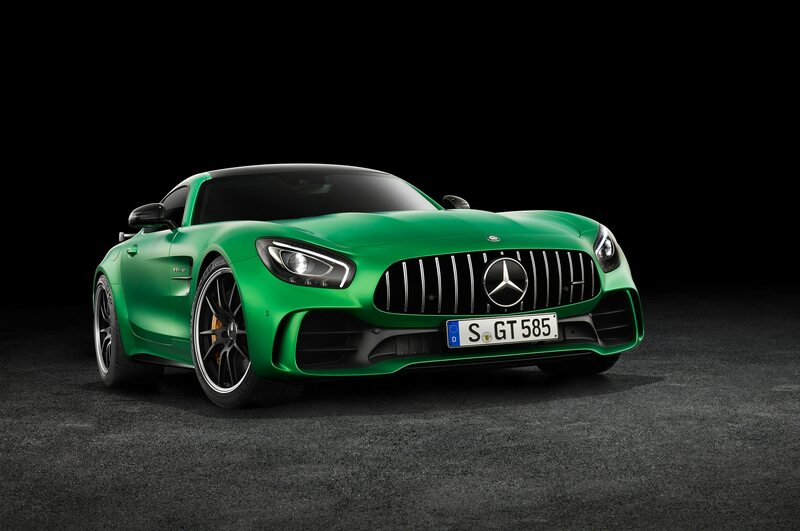 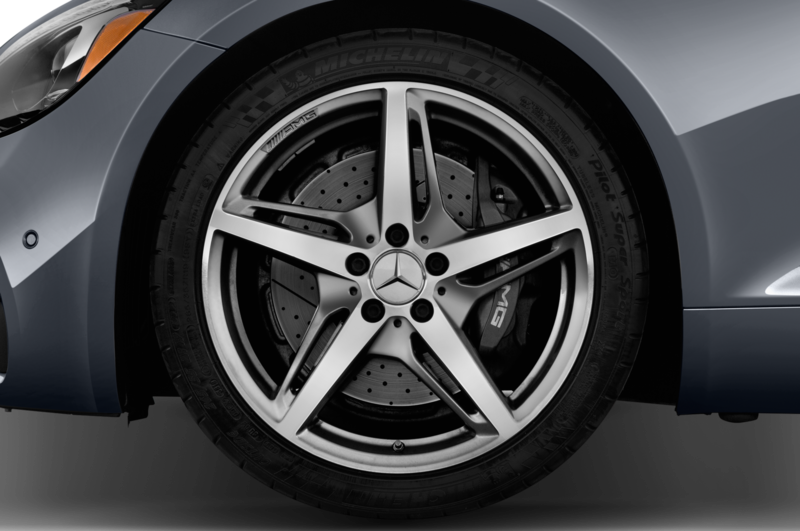 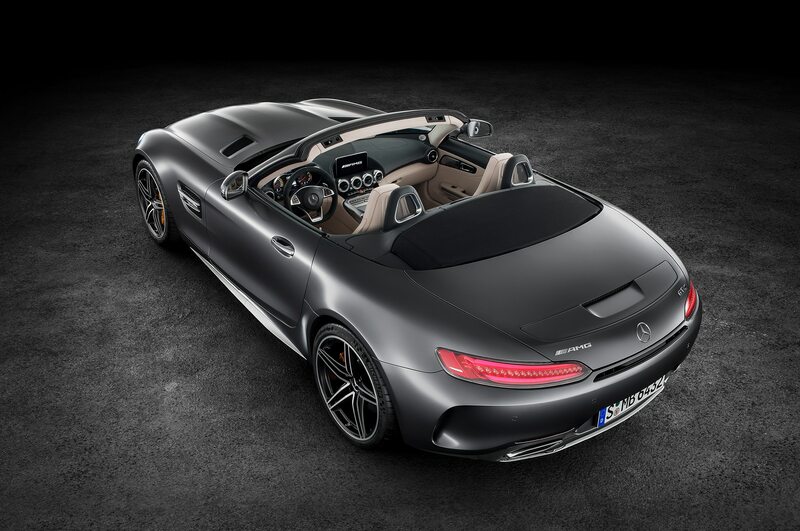 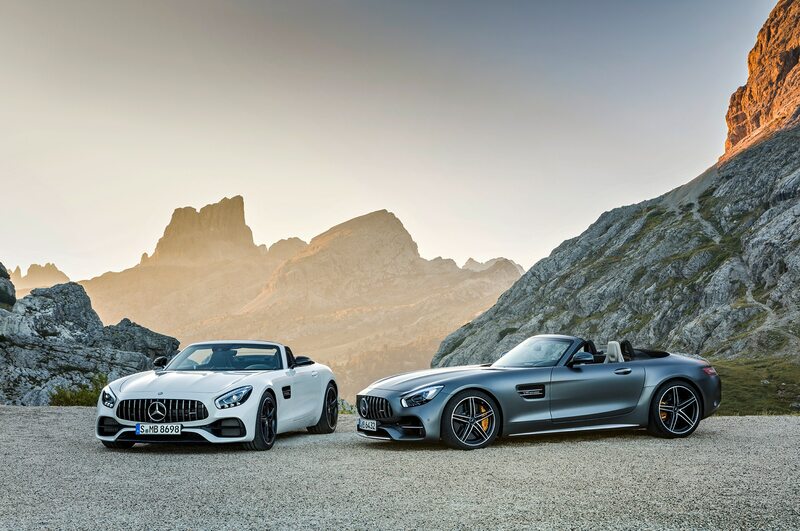 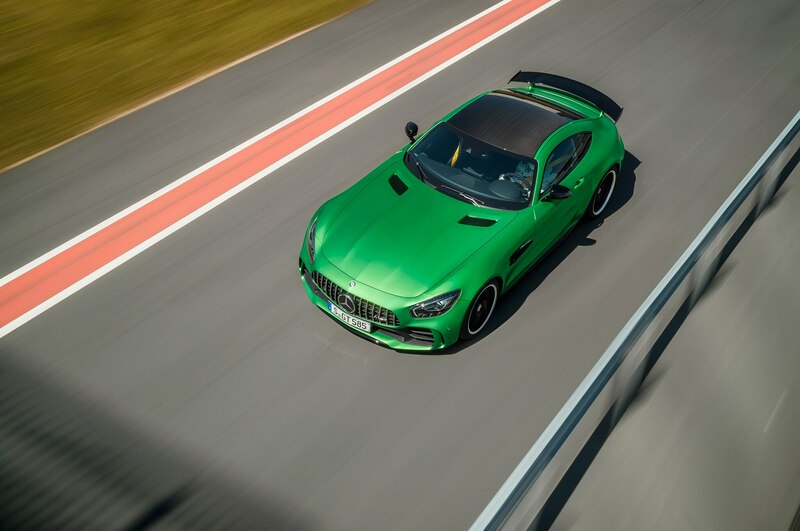 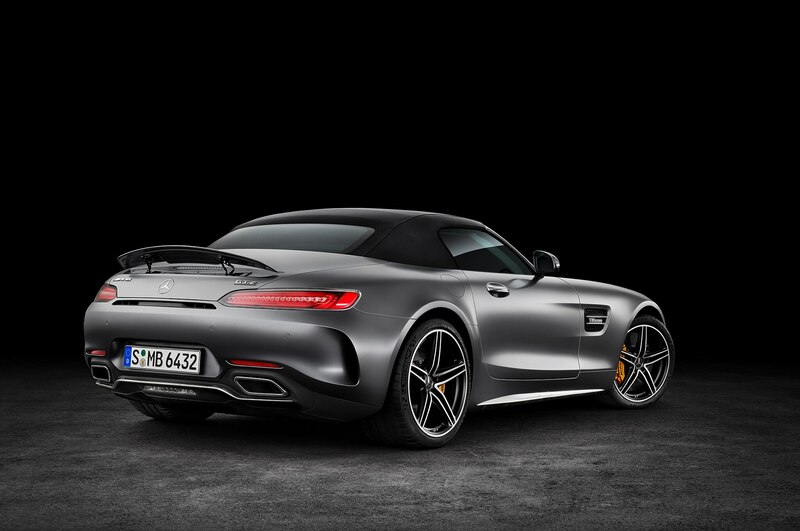 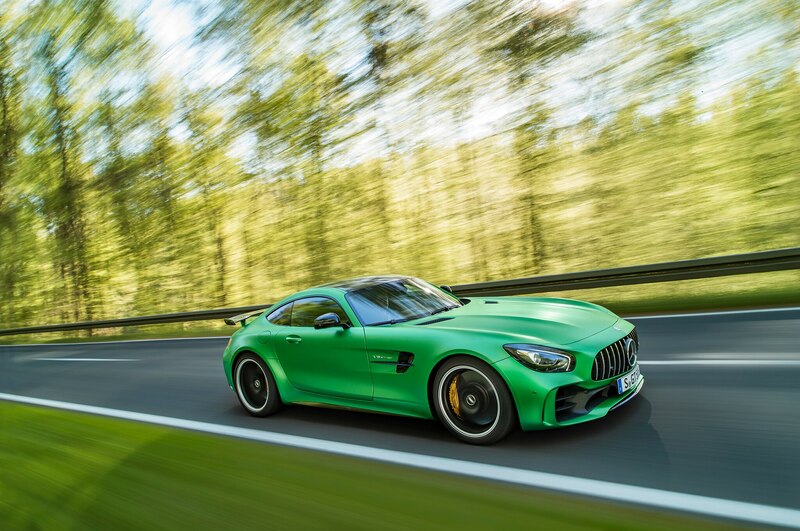 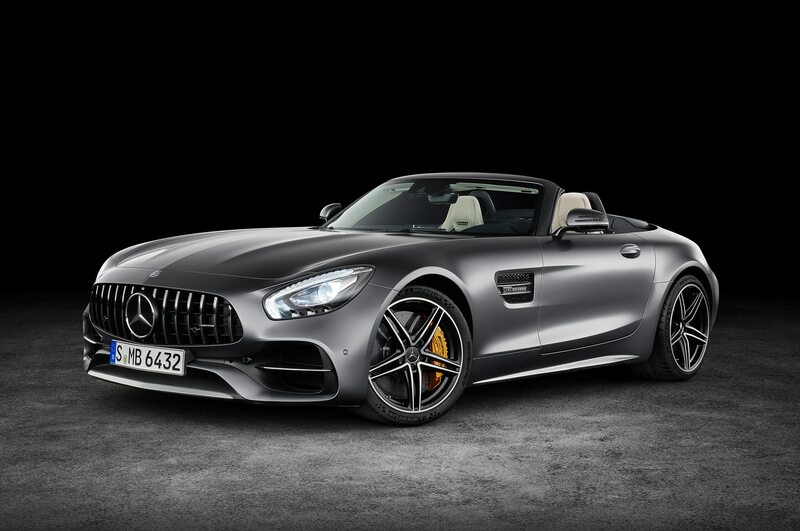 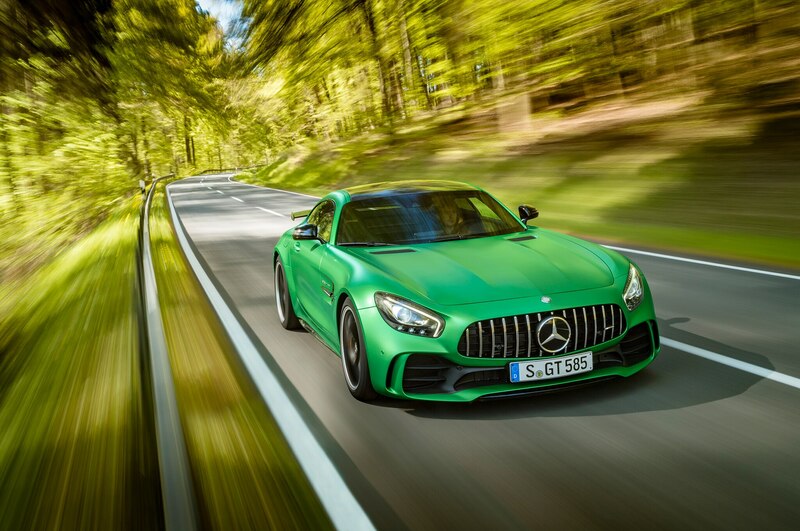 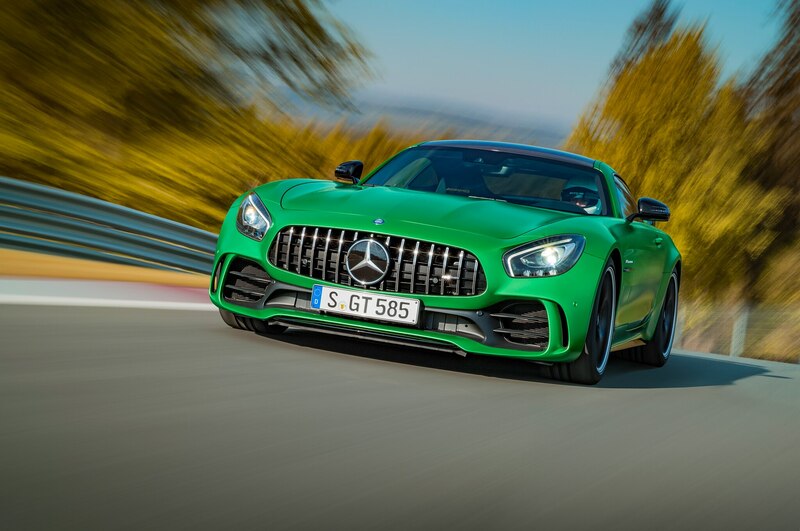 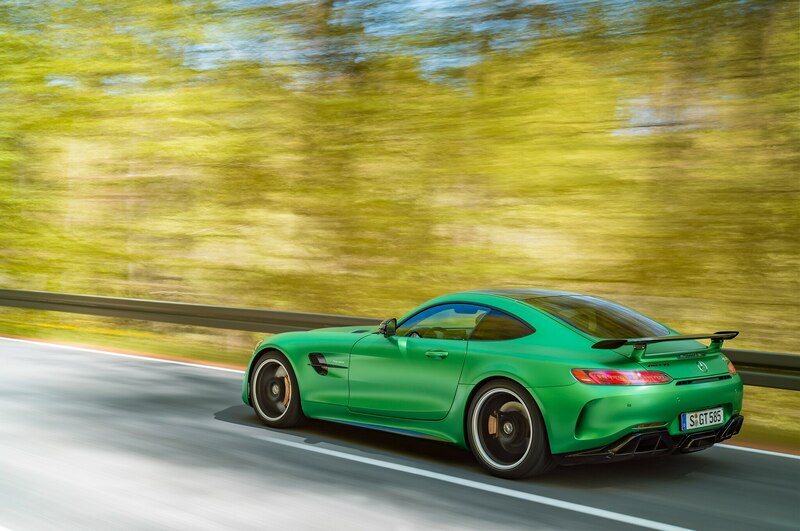 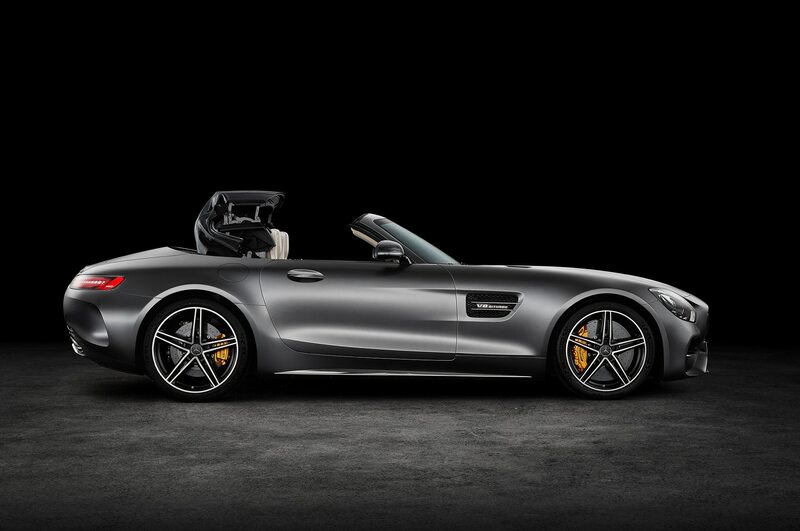 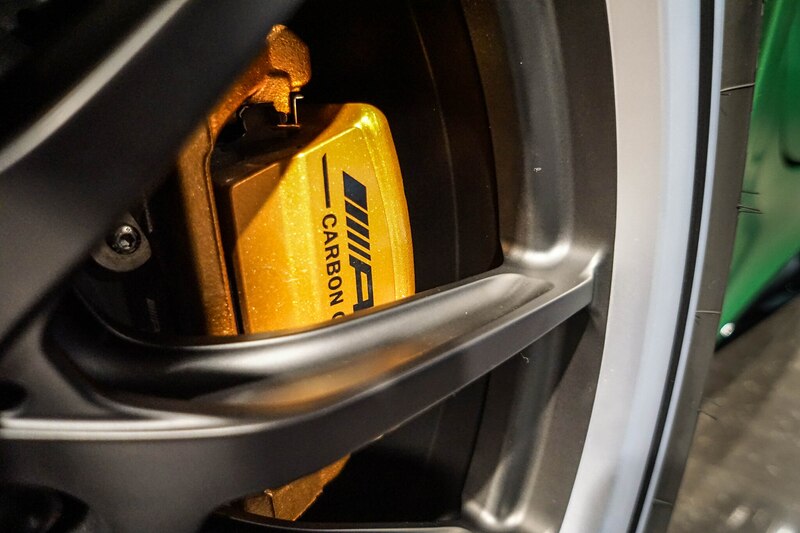 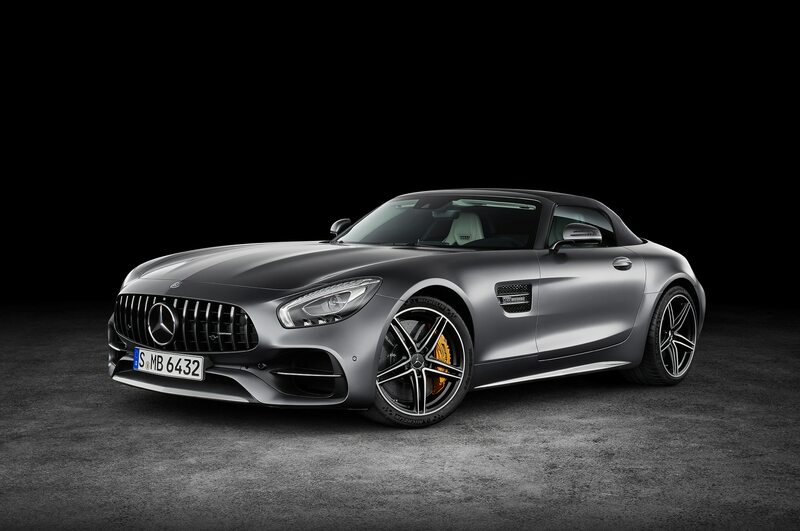 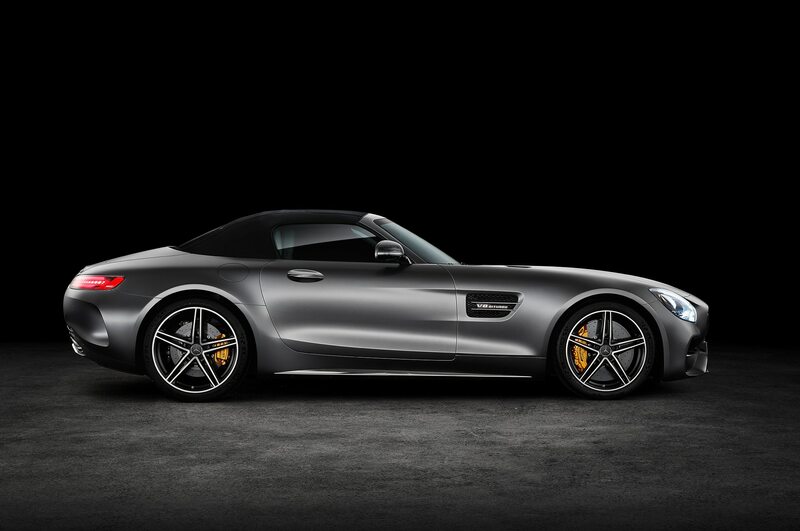 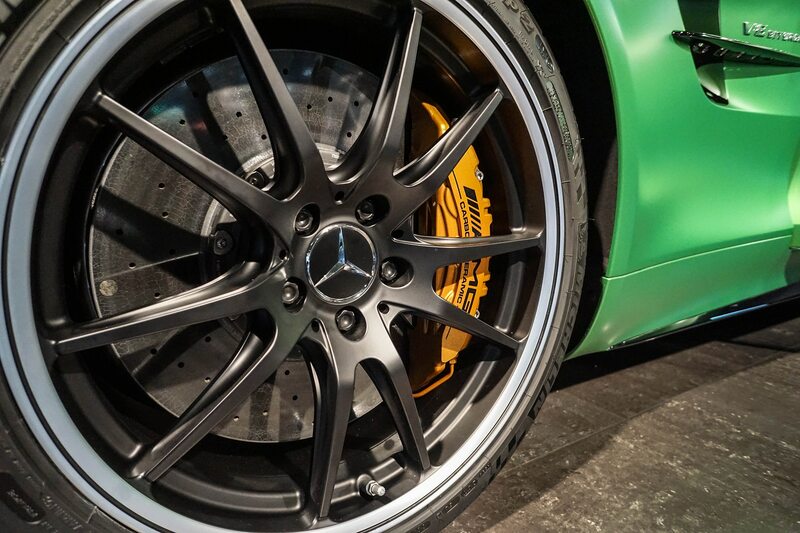 The GT R’s carbon-ceramic brakes use different pads than other Mercedes-AMG carbon-ceramic braking systems. 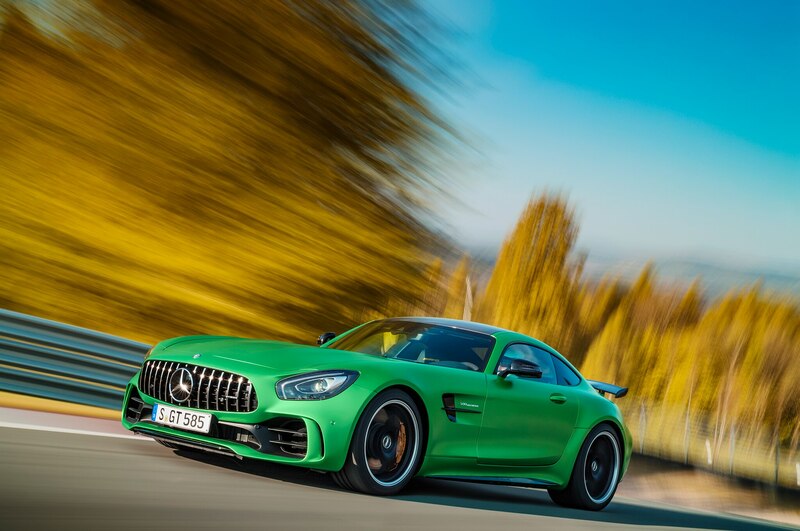 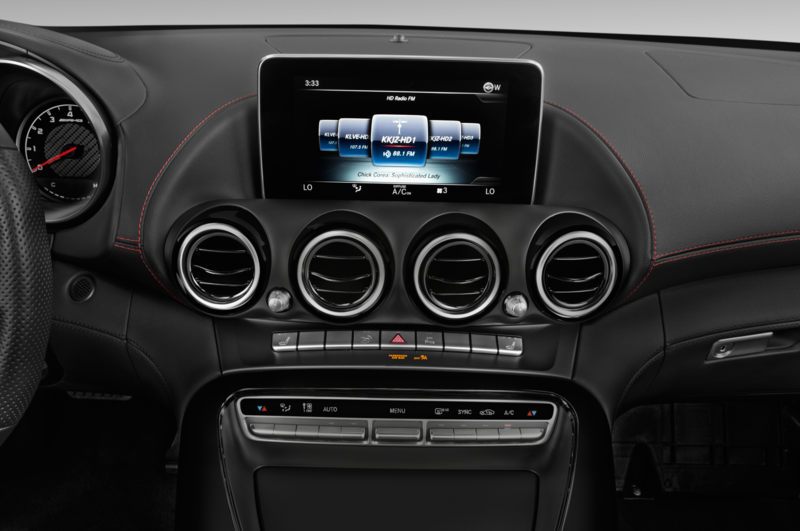 The pads have better fading behavior, according to AMG’s head of chassis development, Raphael Winter. 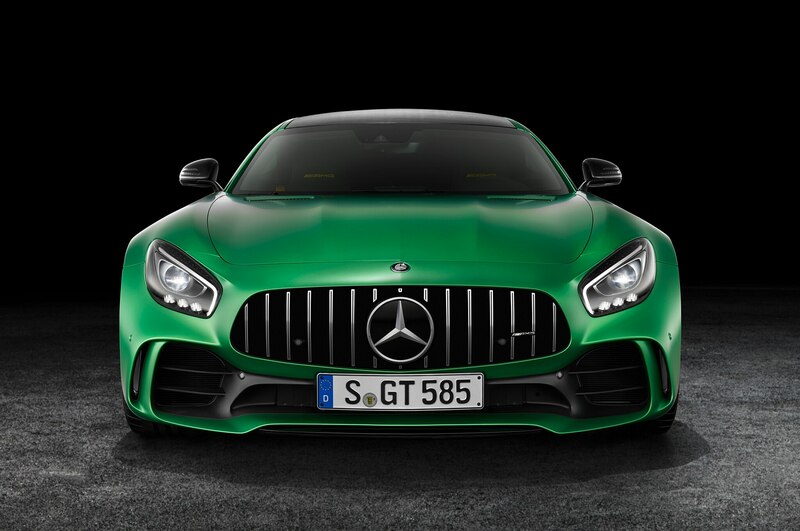 The GT R’s trademark “Panamerica” grille should be terrible for aerodynamics. 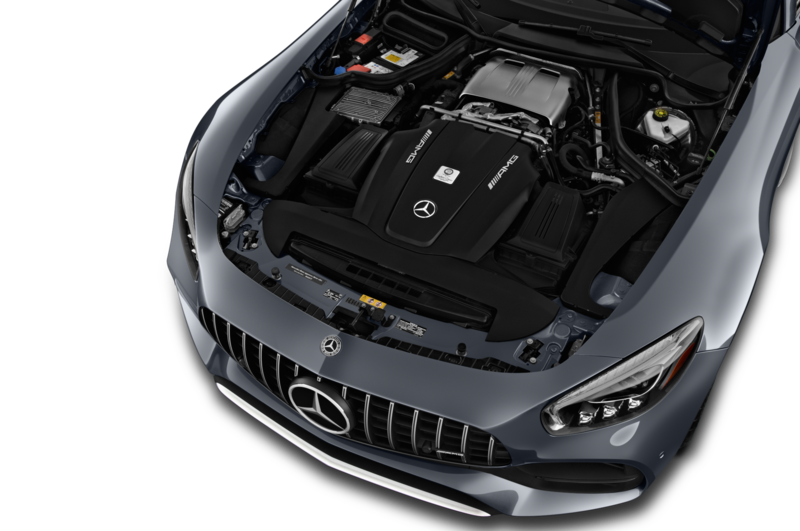 But Estrada and his team tapered the profiles of the grille’s bars to force air into the radiators, and there is next to no air recirculation in the engine compartment. 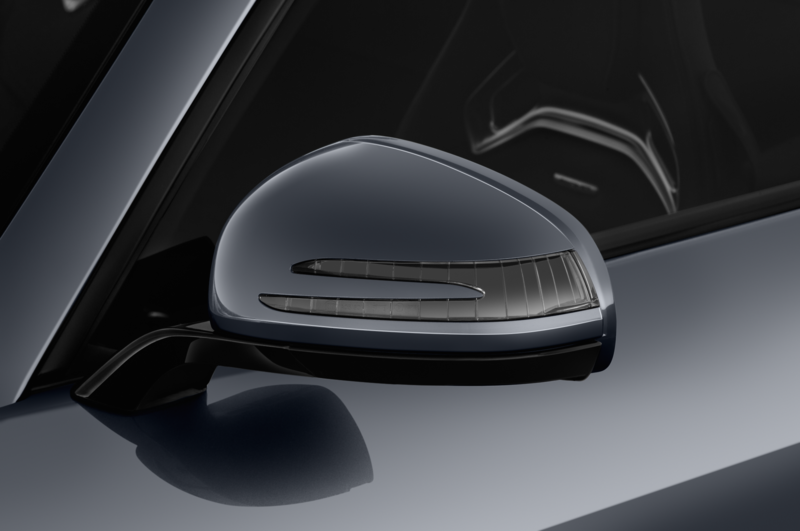 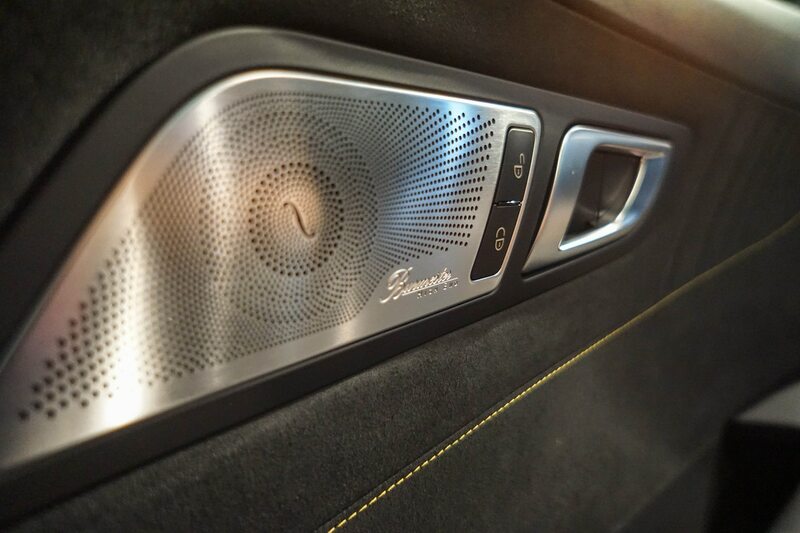 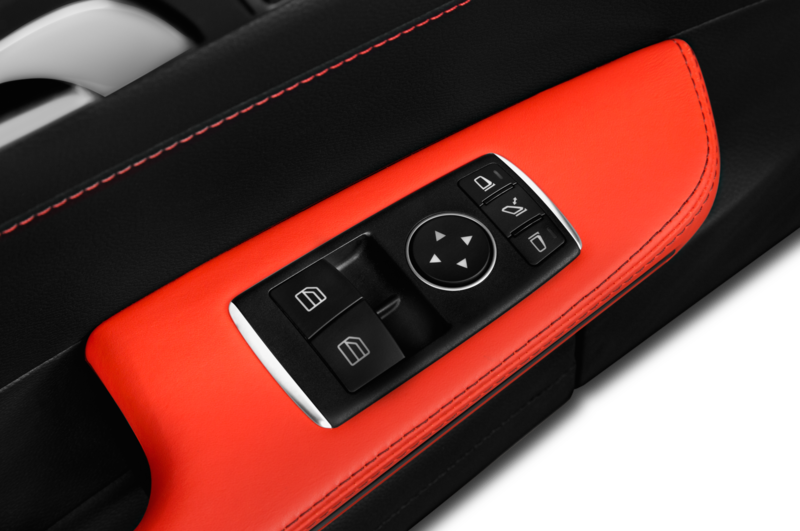 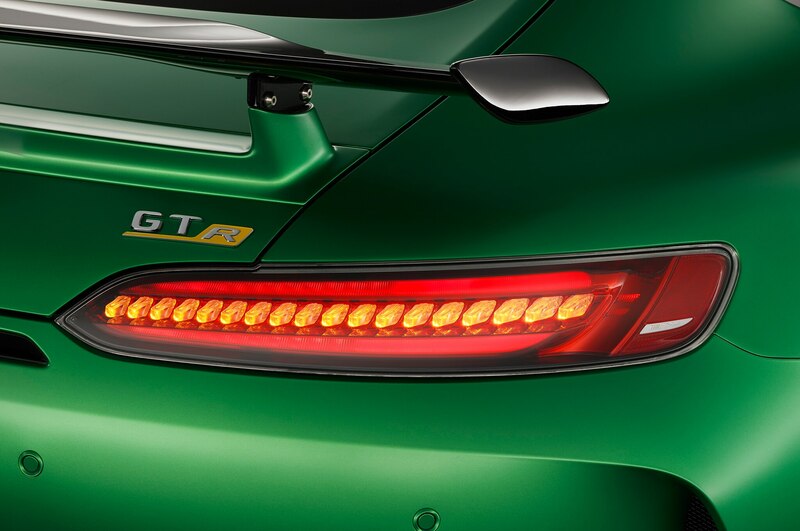 The GT R’s front active air shutters can open and close in about 1 second. 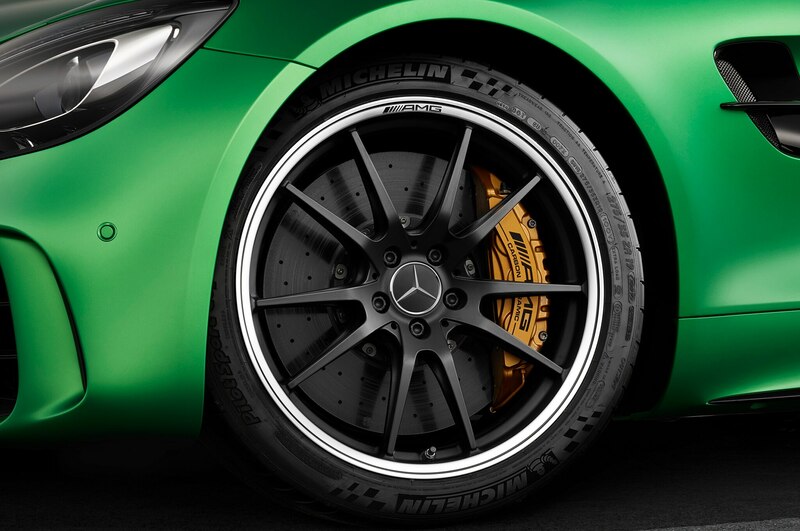 Which is very fast and also very important, because it means the shutters stay open only when they need to. 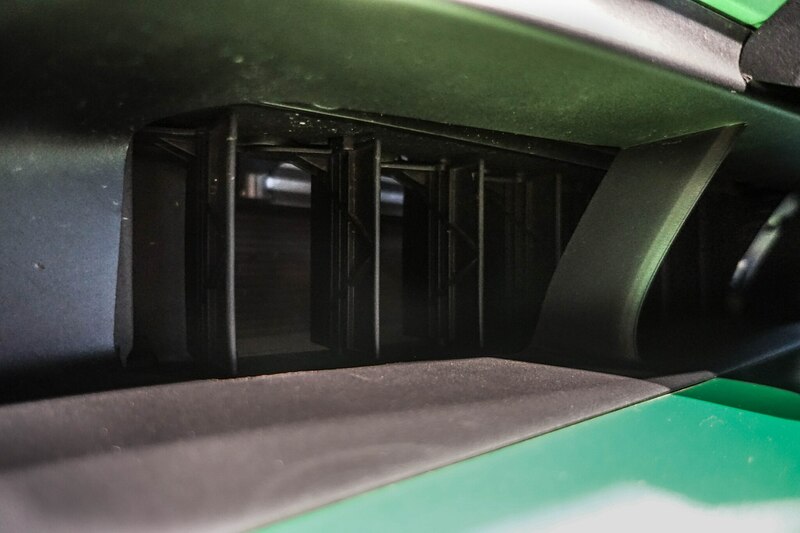 The shutters open, a quick hit of air comes into through front air dam to calm the cooling system, and then the shutters close to decrease drag. 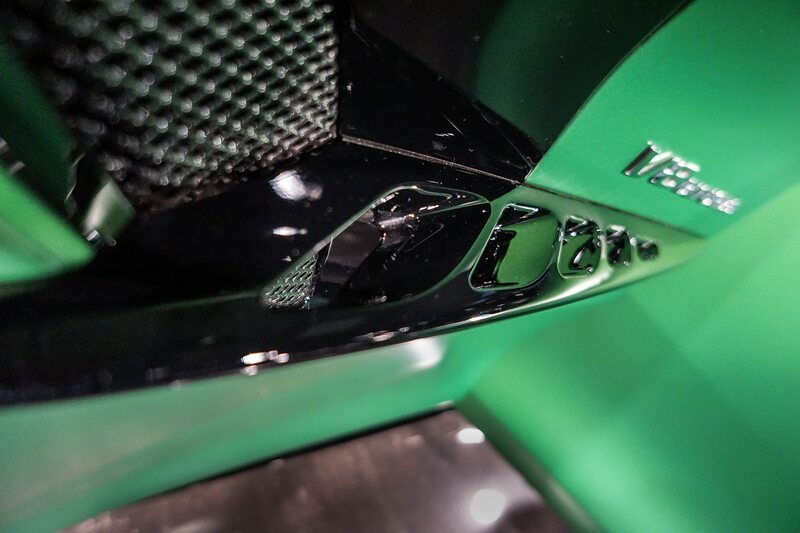 The holes in the GT R’s side strakes are for looks only. 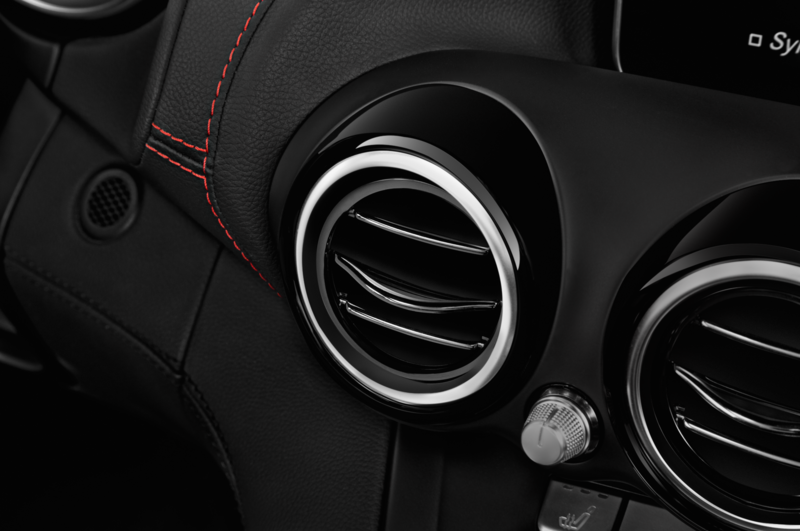 The grilles behind the strakes, though, are functional. 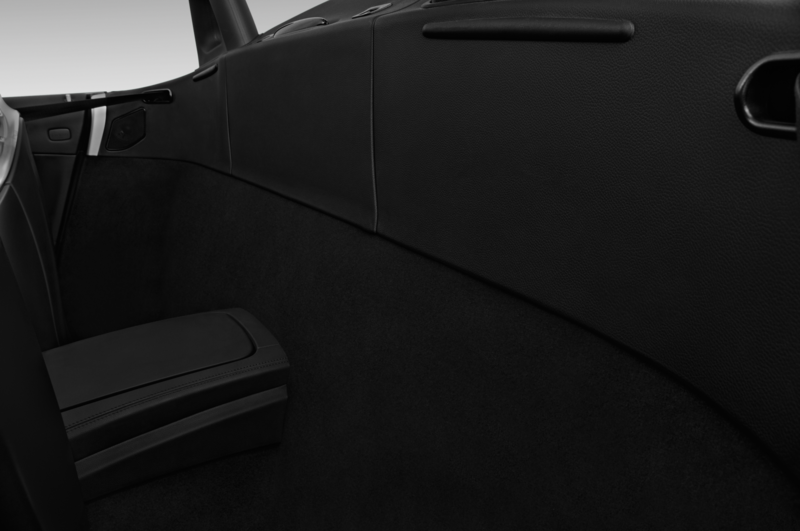 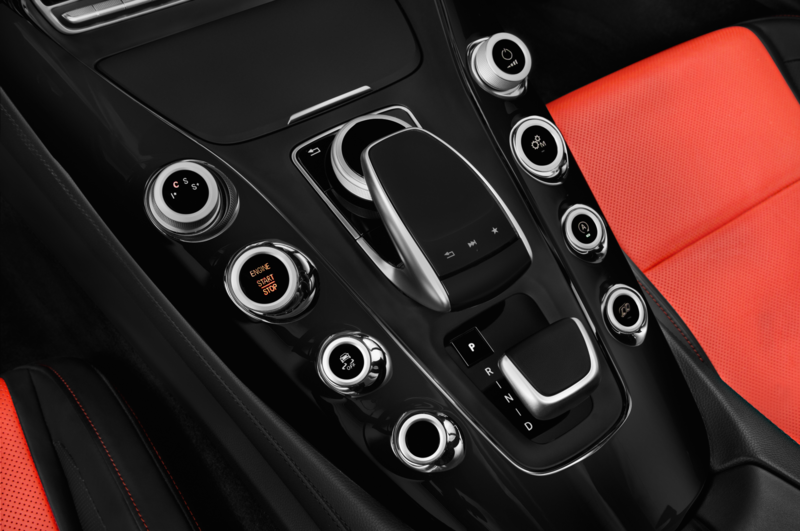 The front bushings on the upper controls arms are specific to the GT R. The bushings needed to be lighter but also smaller, seeing how the all-new forged aluminum arms have less space in them. 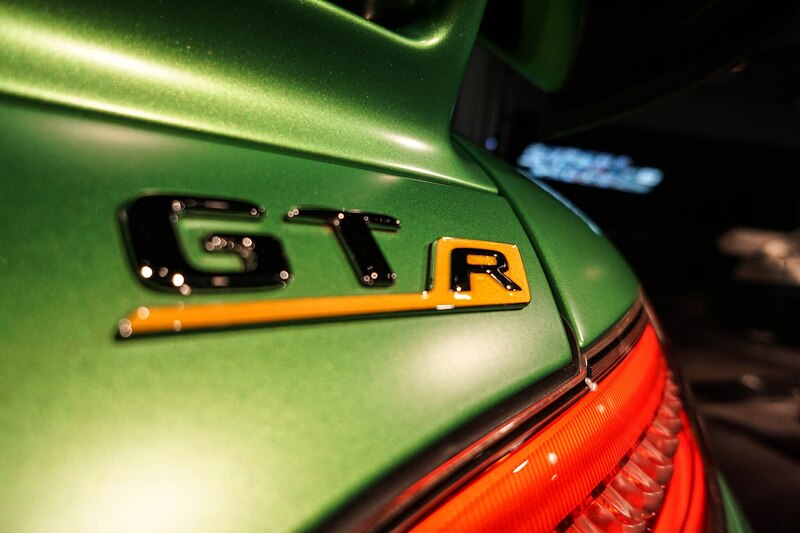 The GT R started with only three traction-control settings before ending up at nine. 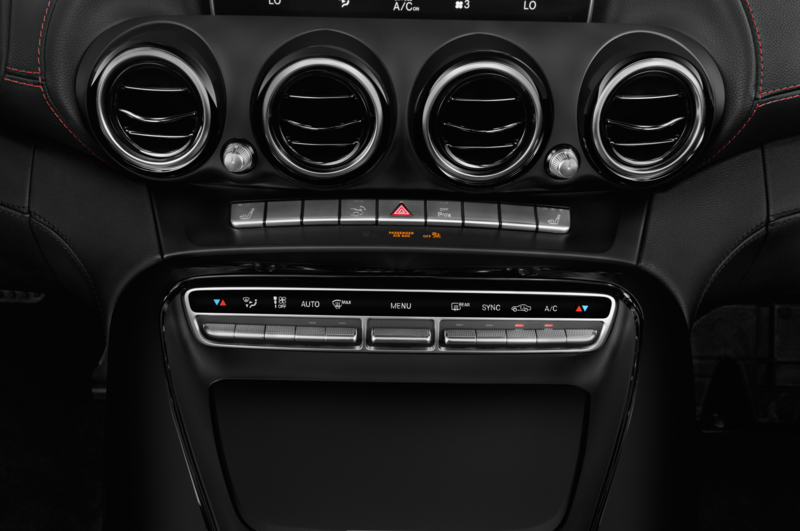 More minute gradations were needed, and finicky engineers finally stopped when they got to nine. 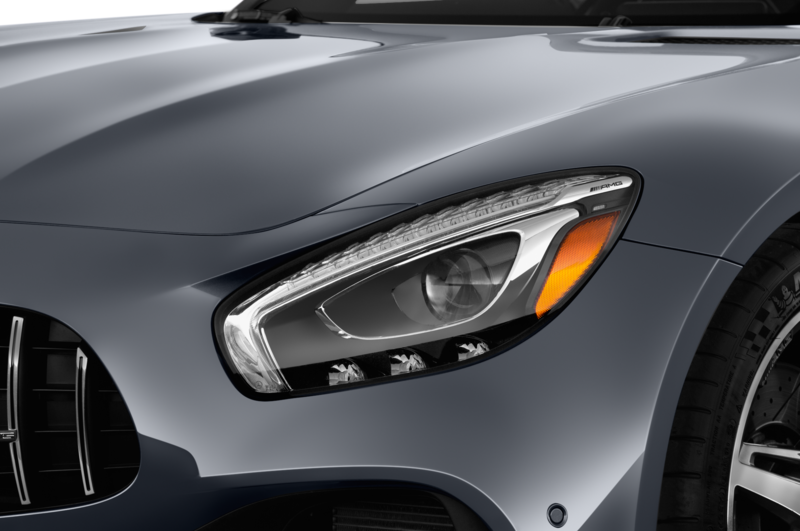 We’re told there are easily noticeable differences in each mode. 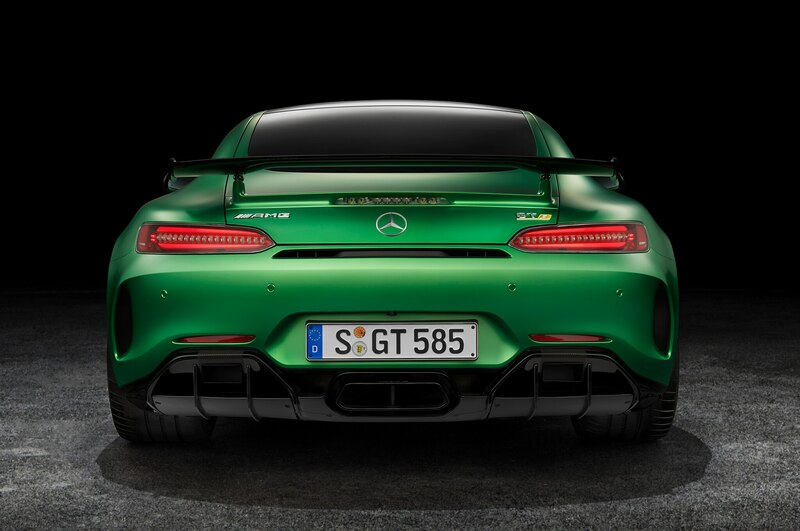 The GT R’s adaptive dampers are shared with the GT S but are upgraded. 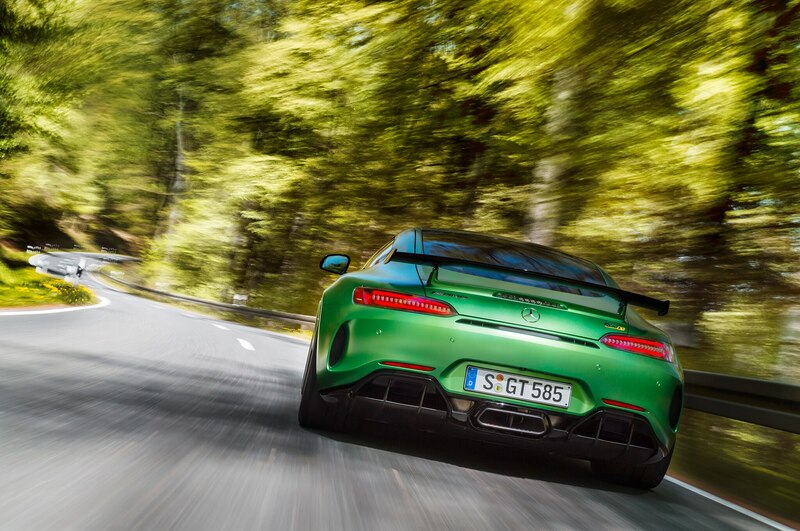 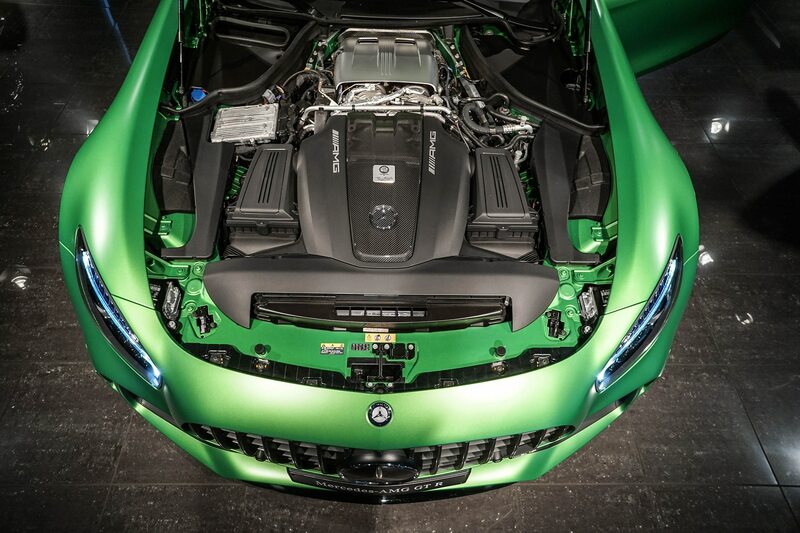 What with higher spring rates, more durable dampers, and more aggressive, race-tuned software. 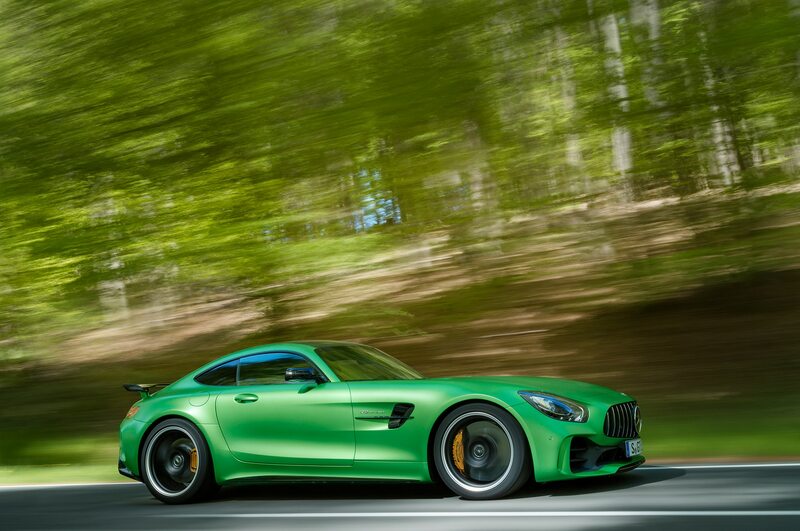 The GT R has a bigger steering pump than the GT S. Bigger, wider front tires necessitated the swap. 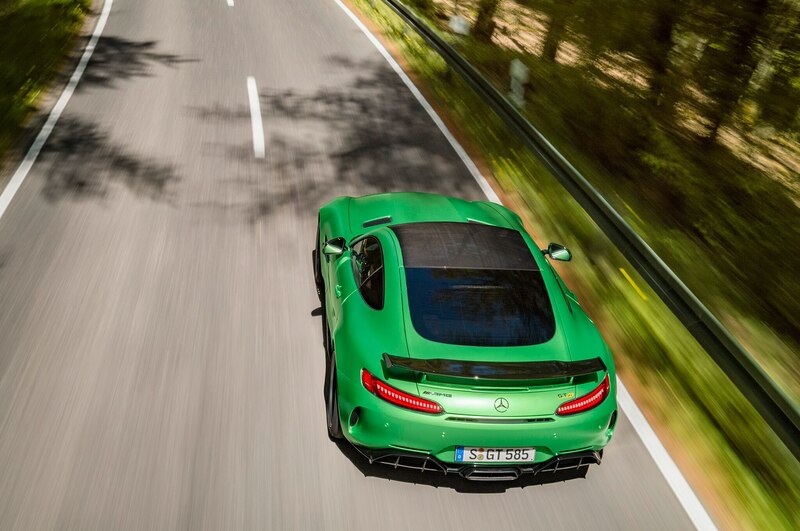 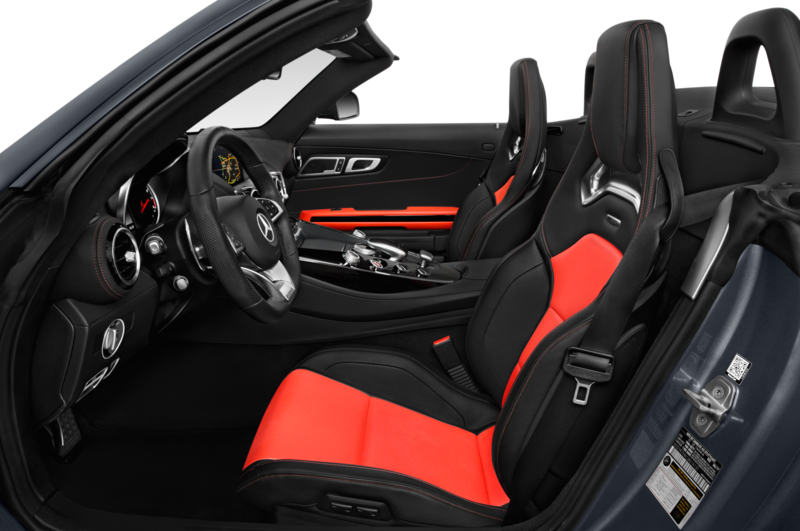 It has nothing to do with the rear-wheel steering system, only steering effort.